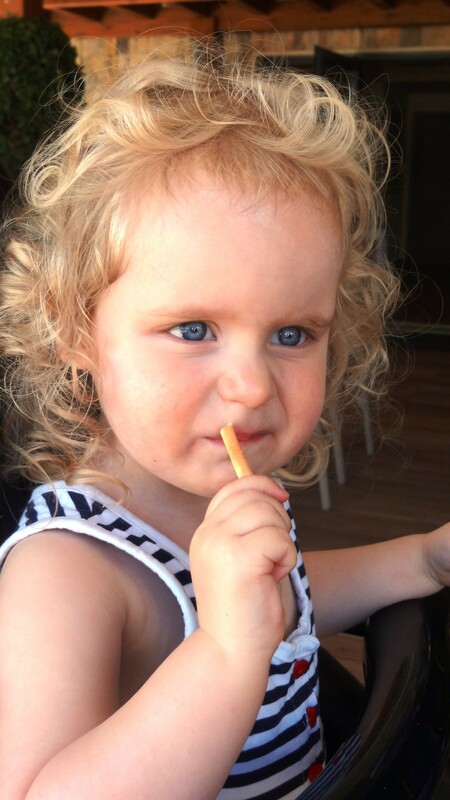 Oh it’s horrible being in love when you’re two and a half…Romilly is suffering the first pangs. We are head over heels with Archie, the Big Boy (3) next door. So much so, she’s renamed her snuggly ‘Archie’ (as in ‘ma Archie bear, no…MA Archie bear, no Mummy, oh no, Archie dirty, oh, ma Archie bear…’). We have panic attacks when we cannot immediately locate him, which never used to happen when he was plain old Snuggly. Now, the real Archie is quite fond of her, and Charlotte too, and has conceded he will marry one or both of them in due course. But for now his own head has been turned by some kindergarten trollop called Violet who, like something out of Heathers or Mean Girls, has a squillionaire for a father. Sadly there is less money in sardines. I may have to arrange for Violet to meet a Dahl-esque accident. In the meantime though, she’s behaving like some lovestruck teen when confronted with the Harry Styles of Chester. It’s Archie this, Archie that all day long, but when he came round to play yesterday she went mute. Archie visits aside, we are now chatting, in distinct phrases. 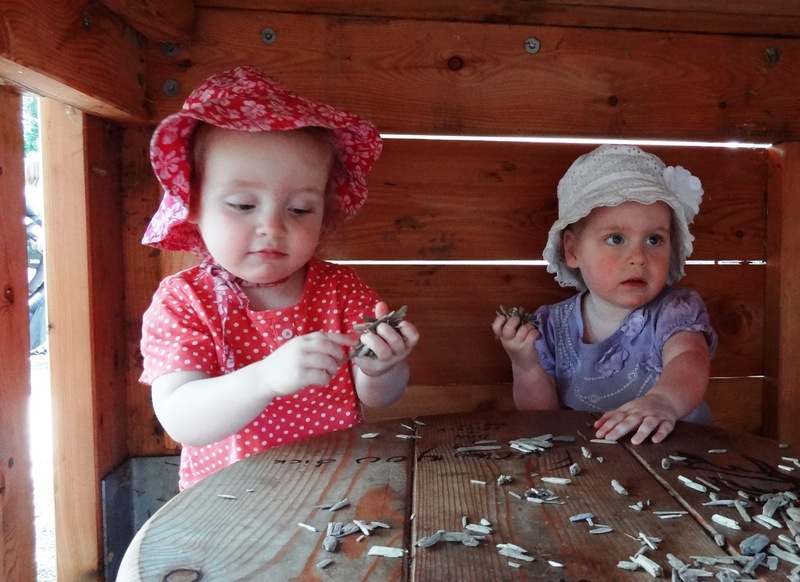 They’re obviously a million miles off it, but Romilly follows words on the page with her finger and chatters away to herself; they’ve clocked what this language lark is meant to be about. There’s a lot of repetition and imitation but they’re clearly understanding what they’re hearing and saying, enough even to try to make jokes. I got greeted with ‘Hi, Cheeky!’ the other day when I came back from work, and then they collapsed in gurgles at their searing wit. That’s been another change, the feeding off and entertaining and plotting with each other. They come up with ideas, rehearse and perform. They made up the exciting ‘hiya, hiya, hiya, mwah, mwah’ song (think Native American totem dance, with added waving and kissing, and percussive accompaniment) one morning in their cots. It’s rather catchy. Jon and I are thanking our stars that we made the decision early doors to keep them in the same room as it buys us an extra hour in the evening and morning. They don’t go straight to sleep and will chunter away to each other instead, and in the morning we eavesdrop on ‘wakey wakey!…no, snooooze….Romree, wakey…no, snoooooze…milk, ok?…no, MA Archie bear…ok?…oh my KNEES…ee-i-ee-i-oh…row, row, row’. I imagine if they were bored and lonely and worried they’d be screaming for us instead. You see, there ARE some benefits to multiples – your twin is your sort-of-inbuilt comforter. I can see full well this may come back to bite us though when they move into beds instead of their current prison cots as they’ll be in and out of each other’s and breaking ribs bouncing up and down on their sister’s chest in enthusiastic morning greetings. But considering we’re keeping them behind bars until at least fifteen that won’t be for some time. They very occasionally play happily together. In fact they’ll do peekaboo with each other, which saves about 50% of my time, and they have invented a slightly alarming new routine which involves Charlotte shoving Romilly face down on the floor, shouting SNOOZE, and then a split second later yanking her up by the scruff of the neck and shouting WAKEY in her face. 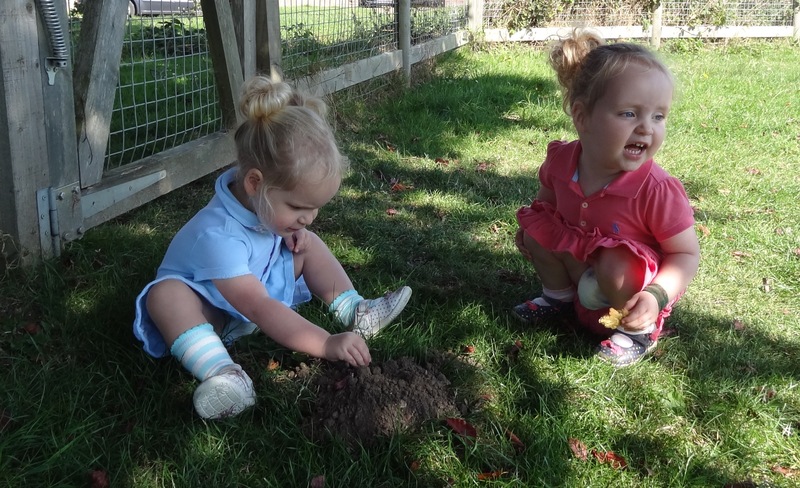 I hope this is not some sick re-enactment of what happens at Nursery! They are both in cackling fits throughout. But it’s a different matter when it comes to the sharing of objects. I’m trying to turn it into a bit of a formalised game, so they each get a minute with a toy and then a high five if they pass it onto their sister, but it sometimes backfires as they’ll only hold the toy for a second and then throw it straight into their face as they want the high five…Charlotte is much more possessive than Romilly, and there will be a fiercely shouted NO if any toy is taken, occasionally accompanied by a push or scratch (we’re teetering on the brink of having to introduce the Naughty Step, and she does get this rather disturbing demonic half smile while she’s doing it, think Moriarty). 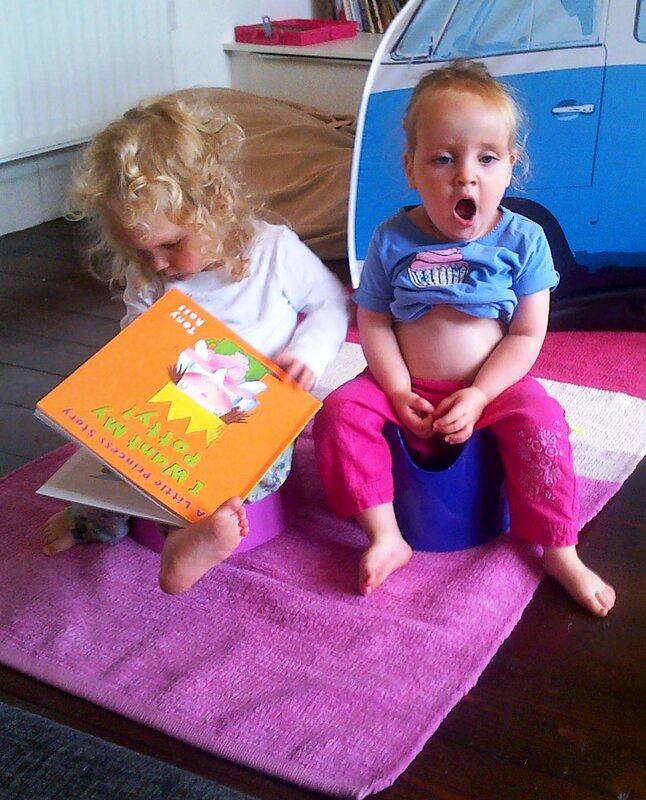 She, naturally, also gets very possessive about the book she hasn’t looked at for six weeks which Romilly takes down from the shelf as obviously Charlotte was intending to read it at that precise moment too. And all this, and I assume a need for security too, leads to her having to cart an increasingly ridiculous amount of worldly goods with her. Any trip up or downstairs now takes about ten minutes because we have two teddies, my jumper with the silky label that she’s adopted, a cuddly owl, a hair bobble and a flashing plastic pig. It’s a bit like an ancient pharaoh being packed off with all his treasured goods to the afterlife. They tell on each other and tell each other off. That’s fun. But the MOST fun is telling on Daddy. Especially if he burps when Mummy’s not there. Or steals some of our food. ‘Naughty Daddy, NO!’ Or on the cat. Often when I come back home I get an immediate report of ‘naughty Daddy, naughty miaow’ before I’ve had a chance to take off my coat. So much so happily hilarious. What’s less so is the fact we have officially entered the Dark Ages ie tantrum time. 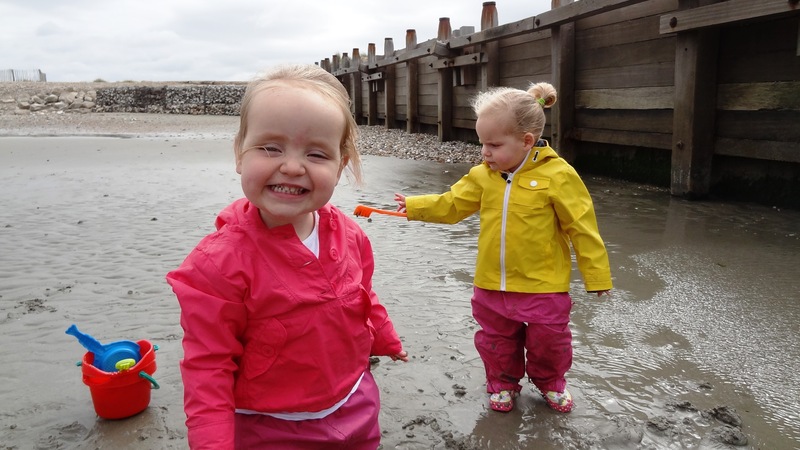 I say ‘we’; it’s basically Charlotte, Romilly just gets a bit stroppy. It’s easier when the tantrums happen at home; you can just follow standard epilepsy procedure and make sure they’re on a soft surface and can thrash away to their heart’s content, and stand there thinking ‘well, that’s one less to happen in Sainsburys.’ Half the time I have to turn my head to hide the giggling (the last one was because there was only space to draw two boats on the paper, not three, imagine that! Only two boats! Quite why that didn’t appear above Ukraine and Ebola on the news I don’t know). But it can also be genuinely shocking. 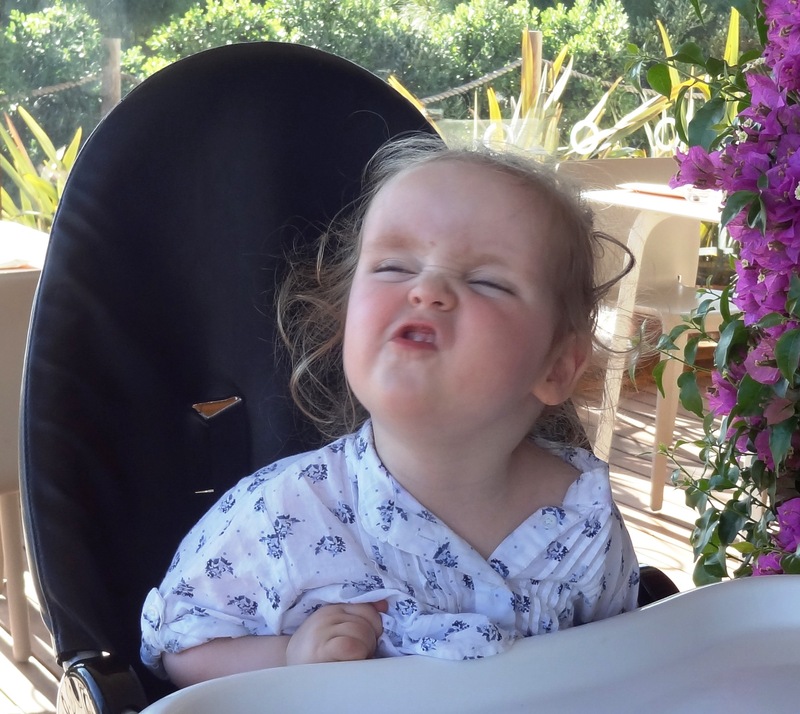 The epilepsy comparison is not a random one; Charlotte literally foams at the mouth, and her body contorts into a stiff paralysis rendering any attempt to hold her unfeasible and her face, well, it just doesn’t seem her there. It’s naked anger and hate and frustration at this huge GAP between how things should be and how they are. 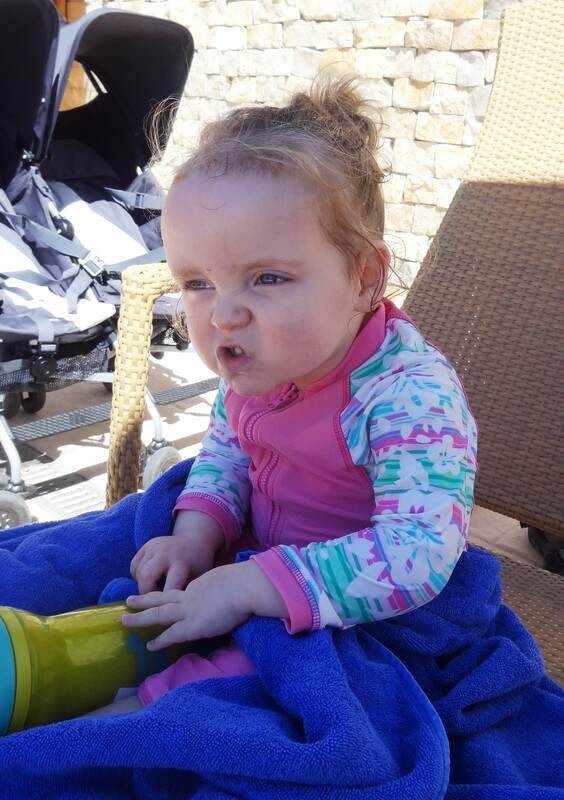 Romilly seems to have the same divided reaction as me; open mouthed, concerned but then also she does very good impressions of her sister. The other day she sat at the table opposite Charlotte, waving her head and arms around going ‘waaaah’ in time with Charlotte’s tantrum with just the tiniest hint of a smile at the corners of her mouth, which had the effect of snapping Charlotte out of it as I don’t think she could quite believe the mickey-taking! And then when it’s all blown over, we’ll ask each other ‘oKAY? Happy? OK? Snack? Happle joos?’ and proffer a favourite toy. Bless. Long may they know their whims and be there for each other at fifty two the same way they are at two. Romilly, as I wrote, hasn’t embarked on her tantrumming career quite yet (pleeeeeease God let them not happen simultaneously) but GOSH we can be a stroppy mare. I’ve written previously about being worried that she was the passive one, and might think she didn’t deserve attention. HA! 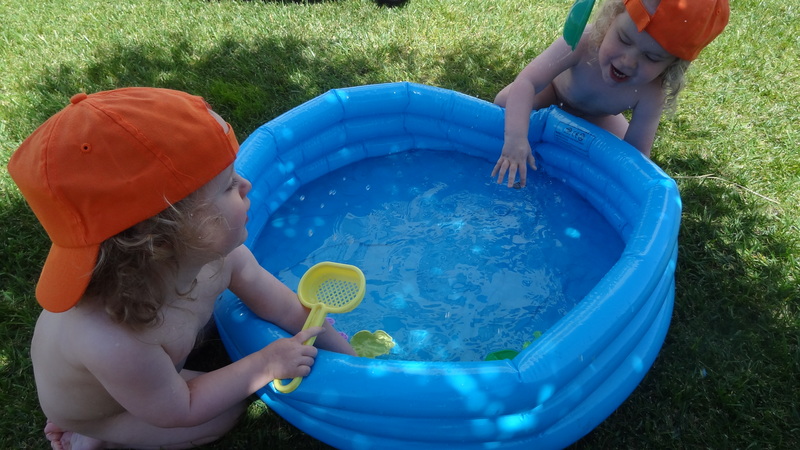 Einstein would have been fascinated by twins as they embody the idea of a universal constant. A constant of bumption. Like a cosmic seesaw, they rise and fall in correlation with each other. 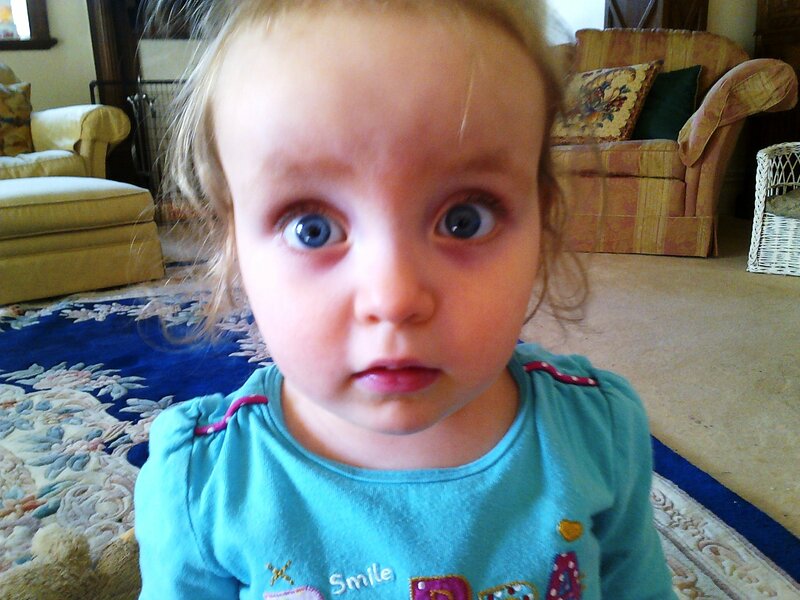 Tantrums aside, Charlotte is generally quite malleable at the moment. Romilly, au contraire, is a spikey pixie. Her favourite word by a country mile is NO. When I say ‘do you mean yes?’ we get NO. ‘Shall we practise saying yes?’ NO. No bobbles. No snooze. No bath. No milk. No snack. No hold hands. The identity flux and continual role reversal is fascinating. I guess all little people are being built, and building themselves at this stage. But with twins this ebb and flow, the lability of it all, seems relational. The universal constant isn’t just cheek, it’s all personality traits and, to a certain extent, functional too. So at any one point, one will be more or less happy, one will be more or less chatty, one more or less feminine, one will be more or less into books, always adding up to 100 as a pair. A miniature animal. And a horse. On the more physical side, the keener reader will remember that Romilly is atopic, and lacks pigmentation behind her eyes, gets allergic reactions, and has dry skin (along with occasional eczema flares). We’d been advised that there was a strong probability she’d grow out of a lot of this, but as a Mum you fret, don’t you, and I had visions of her having to endure school from behind dark glasses, and being teased for her leprous skin (which apparently is what her FATHER used to do to an unfortunate fellow pupil, for which I apologise on his behalf unreservedly!) But she seems absolutely fine with bright summer sun now, only avoiding to the same degree any sensible being would. 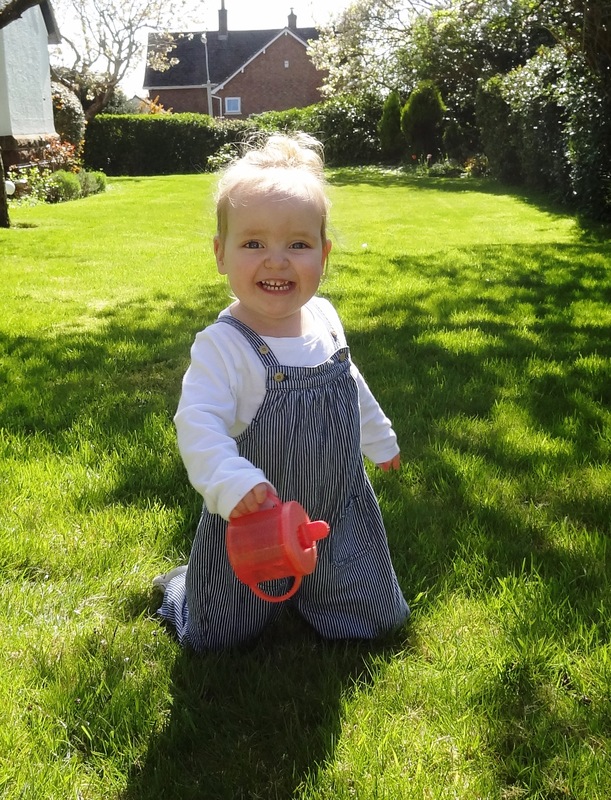 She still gets pink and blotchy with too much grass or straw etc, but it doesn’t seem to bother her, and we haven’t had any full blown eczema flares for ages (we have hydrocortisone for that eventuality). All of that seems the great healing property of time, but one thing which has added some value in the here and now is using Oilatum, both in the bath, but also as a skin cream. We’d previously been using just the standard dermal cream from the doctor, but she still had permanent raised bumps on her arms. Since using the Oilatum they have decreased significantly and it’s become rather a lovely ritual of an evening. I can actually get her to lie still while we do her ‘magic cream’ and she goes a bit trance-like. Long may this last! 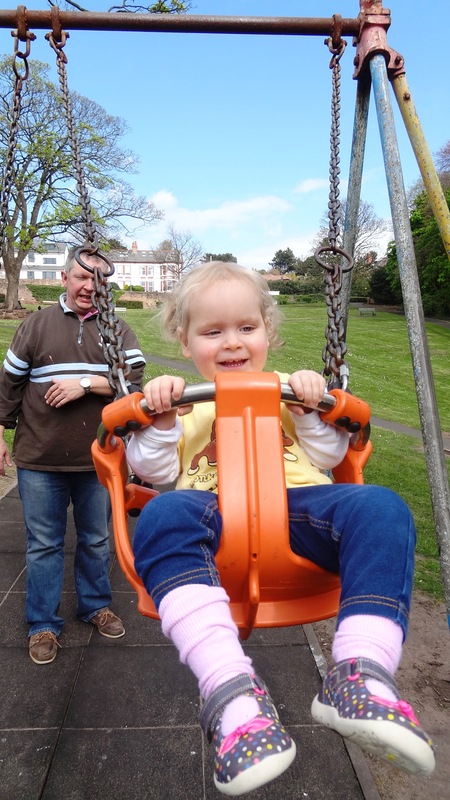 Charlotte’s issue has always been ‘ma EEEERS!’ She’s got glue ear and, connected I think, bad motion sickness and a fear of things like swings/slides. 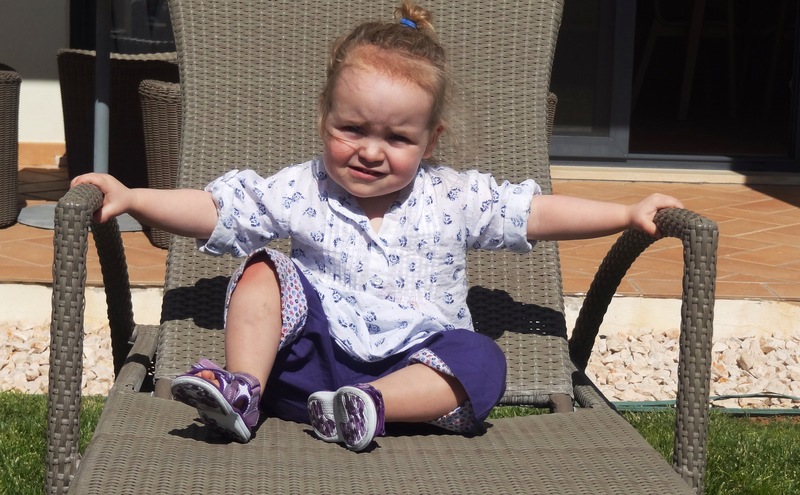 She’s going to have grommets fitted but we’re trying to hold out till she’s three, as then she can be operated on by the nice doctor at the nice hospital (blatant euphemism for private!) To be honest, there’s a part of me procrastinating too seeing her tiny body go under the general anaesthetic. But in the meantime I don’t know whether it’s time, or the antihistamines we drug her with, or the new travel wristbands, but she’s just managed a 6 hour drive to the south coast and then back again with nary a hiccup. Hail Mary! And with that, and in the words of my all-forgiveable daughters, bye bye PIE!!! This is very funny. Apparently. 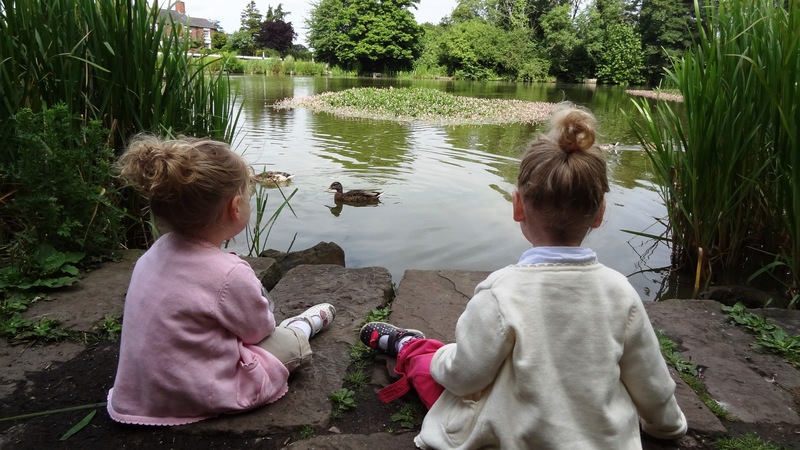 It’s been ten weeks since we moved to Chester, and we have had a lot of Awfully Big Adventures, so I thought it high time to share what we have found so far to do with little ones in and around the city for those who’re new to, or visiting, the area. Choo choo! We love this little train that chugs at quite some speed round the lake by the play area, and all visitors are dragged there, with us claiming it’s because the girls like it. Secretly Jon wants to apply to be one of the drivers. £1.50 for adults (though I recommend you go for the 3 ride option, as they won’t want to get off) and free for under 3s. It leaves from a proper little station with a waiting platform, and a shop packed full of Thomas goodies. Grosvenor Park itself is gorgeous. It’s where they hold the annual open air theatre. 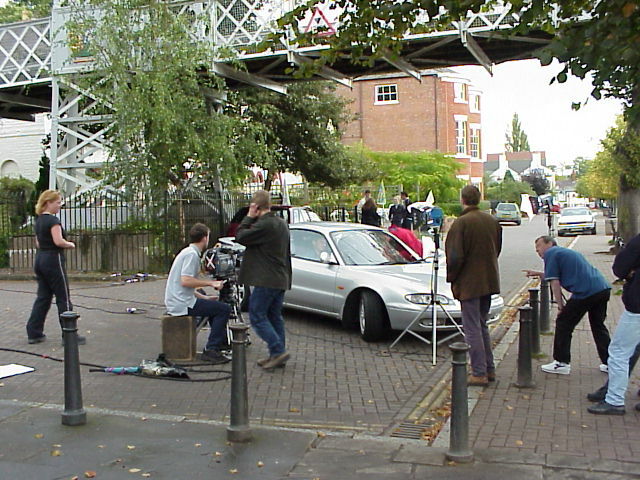 It’s just by the river and the footbridge, so we find the best parking is on Victoria Crescent and then strolling over the bridge, rather than trying to find a space in town. At some point, when my heart is no longer in my mouth, we’ll take the girls on one of the many river cruises that leave from The Groves (the esplanade with its generous allocation of benches and bandstands by the footbridge/Grosvenor Park, gosh Chester Council must be making a decent income from tourism). There’s one that goes up to Eaton, the Duke of Westminster’s humble abode. You can also hire canoes, pedaloes and small boats, though at eyebrow raising prices. Allegedly there is also a passenger ferry in summer months (for which you make a small donation) that takes you the 10 metres or so across the Dee from the Meadows to Sandy Lane Aqua Park. If that brings up visions of a Cheshire Sea World, it’s actually just a playground that has a section with various sprinklers on a random programme, so the kids can strip off and have hoots of fun running through them and getting wet. Literally 5 minutes from our door, even for little legs, which is fantastic. 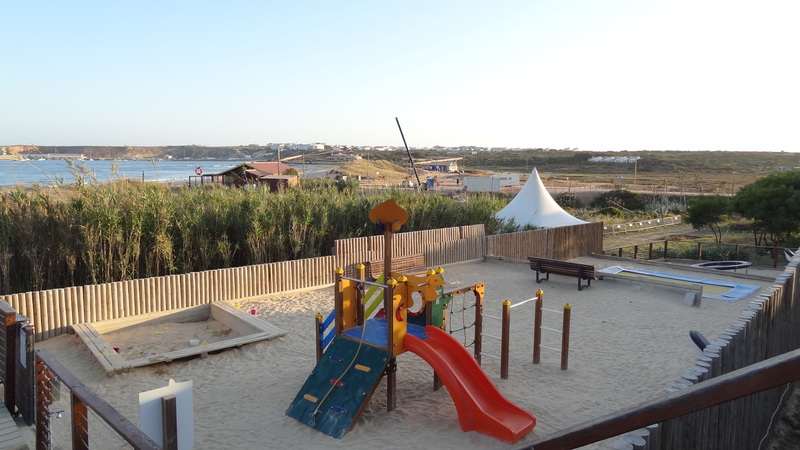 The children’s playground is large and very well equipped and maintained, and there is also an open air gym for adults (which I, unsurprisingly, am yet to try), 9 hole golf course, bowling club, tennis courts and a Croquet Club, who hold the Advanced title for the North, woo! All the paths are marked with metre markers if there are runners in the family. Jon had to explain to me what these were; I thought it was measuring distance to the café and their exciting Sunday morning offer of a bacon buttie, cup of tea and two rounds of golf for a tenner. If you walk south through the park you’ll get to the Westminster Park shops, where you’ll find Bebbingtons the butchers. It is a fine establishment but do NOT buy anything from there as I recently entered a ‘create a new sausage’ competition and was narrowly pipped to first place, so now face the shame and bitterness of seeing my rival’s sausage on sale. It hurts. This boycott will obviously be lifted when I win next year. 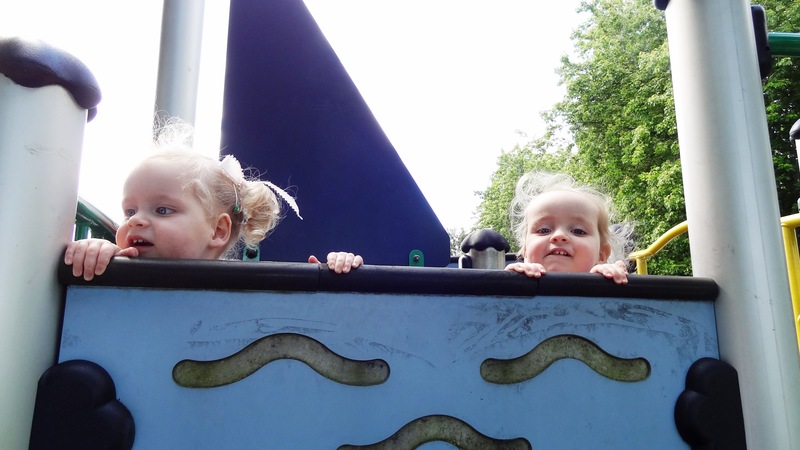 Blacon is one of the less ‘naice’ areas of Chester but has this fantastic city farm come adventure playground come woodland activity centre come youth club. It’s run by a charity so you just make an optional donation. Donkeys, sheep, goats, the world’s fattest pigs, chickens, ducks, rabbits and occasionally a kangaroo (yes, that confused me too). This is pretty much where the girls learnt to walk in order that they could run away from me at speed towards a giant muddy puddle (damn you, Peppa Pig) or the donkey’s hooves. The Sealand Road retail park (I know, living the dream) has got something for everyone. 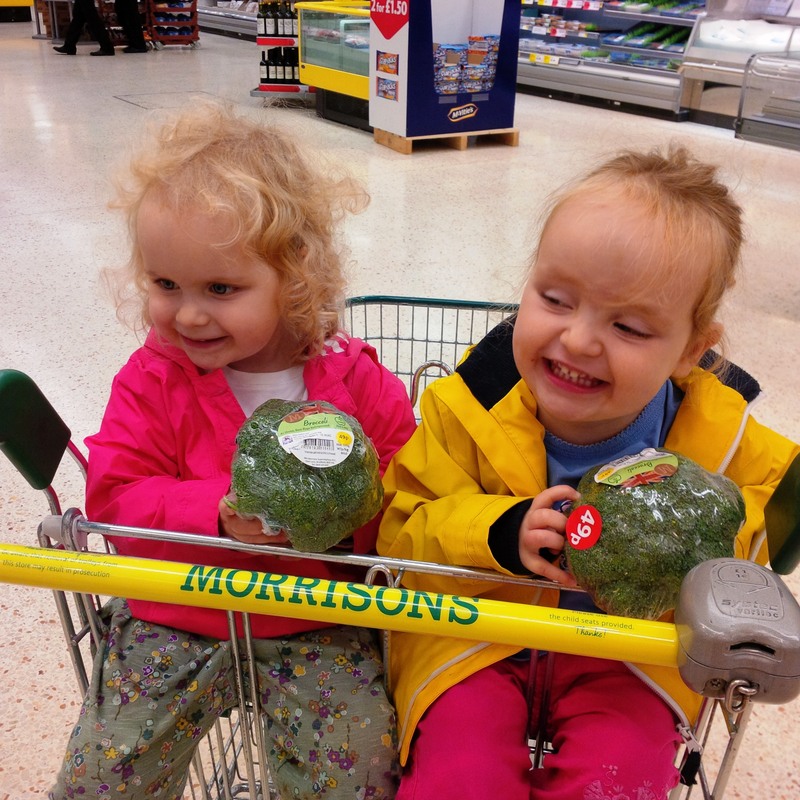 Our routine has evolved into – T K Maxx/Aldi, to feed my Bargain Addiction, Tesco to scoop up anything Aldi didn’t have, and then Fun 4 All for soft play for the girls. 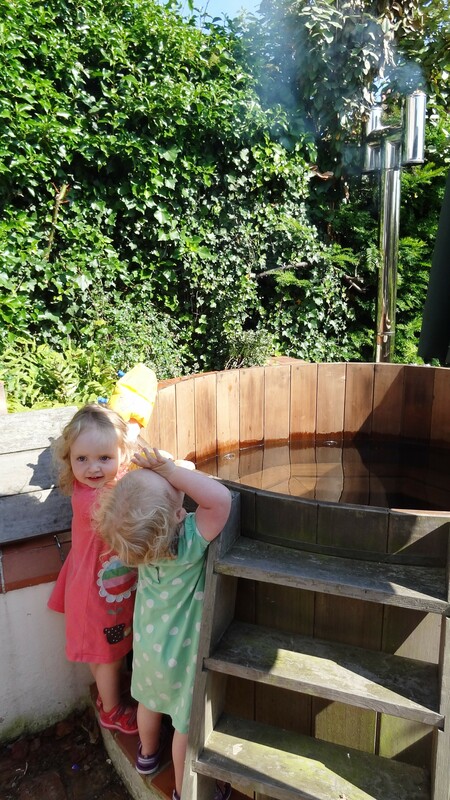 It’s vast, spotless, has a really decent area for under 5s, refreshments, and a ride on Magic Roundabout that costs £1 that I made the mistake of putting them on once so we now get tantrums at my Pol Pot level cruelty for not allowing repeat spins. No shoes, so remember to wear socks. Otherwise they make you wear their hideous ones and charge you for the opportunity. 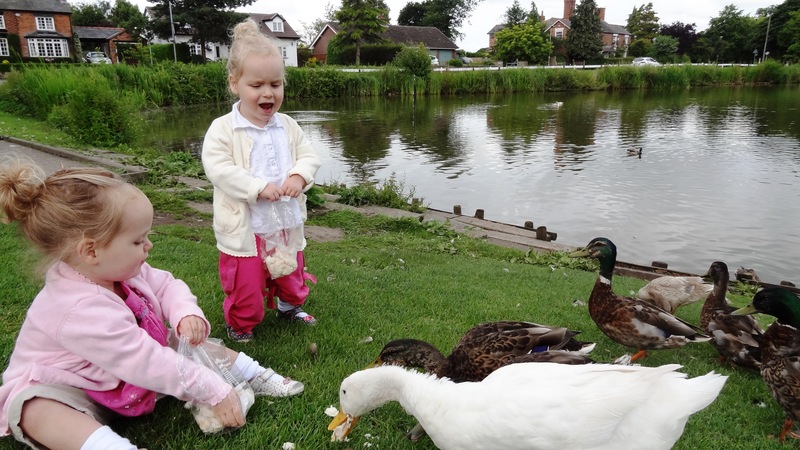 Christleton is a picture perfect Cheshire village on the outskirts of Chester. Just gorgeous red brick cottages trimmed in wisteria and a splendid gastropub in the form of the Ring O’Bells who do excellent 2-4-1 burgers on a Monday. 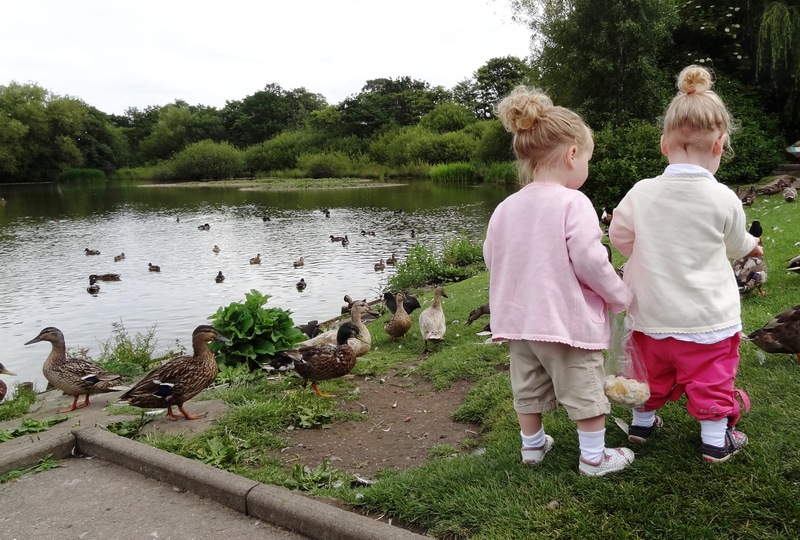 There’s a duck pond on Heath Lane which is ever-so-pretty and the ducks will come up to the girls for bread (I know we shouldn’t, but) and obligingly shed their feathers for collection. Further down the lane is yet another playground, probably the best we’ve found. It’s got a sit on digger for moving sand! 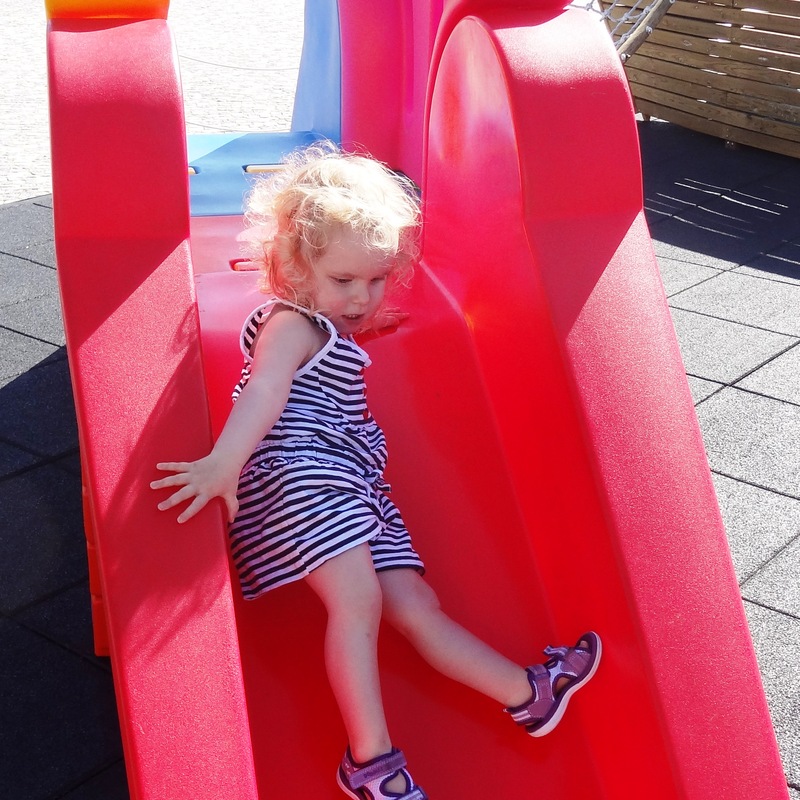 The slide is built into a hill so no ladder to climb! It’s got a wobbly bridge! And the girls can exercise their need to escape me as it’s in a giant, fenced off field, so no dangers unless wolves are suddenly reintroduced to the North West. Going the other way into Wales, just past the giant Airbus factory, is this lovely farm which does pick your own strawberries, raspberries, gooseberries and blackcurrants, has a HUGE and very posh farm shop with their own butchers and deli (try the Dragon’s Blood scotch egg and the Welsh Oggy), a great café, chickens, and a wooden castle for the kids to play on, all surrounded by the rolling Welsh countryside. What more could you want? Oh yes, a September family festival with Cerys Matthews and chef Bill Grainger, that’s what! All very Boden/Lattetude. Bizarrely, this is a regular haunt, and not just because Jon has become obsessed with turning our pond into a cross between Fining Nemo and Monet’s Giverney. Great café, plants and fish for the girls to look at. St Mary’s Handbridge, from 10am on Thursday mornings. Beautiful church with a well attended group from babies upwards, and very welcoming ladies hosting. 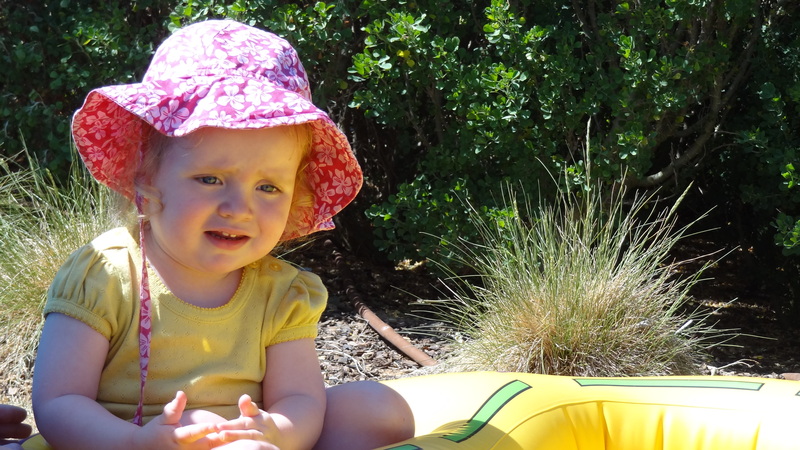 Charlotte likes the toy iron best; Romilly the trampoline. Snacks and drinks for everyone. Outdoor singing on nice days. Sparks at Hoole Baptist Church from 9.45-11.30am on Wednesdays. Great toys and crafts too. Northgate swimming pool (we felt a bit guilty on holiday that the girls seemed to have regressed when it comes to swimming, which is entirely down to us not making the gargantuan effort that is getting two slippery little people changed for swimming, swimming without drowning, and then changed back again). 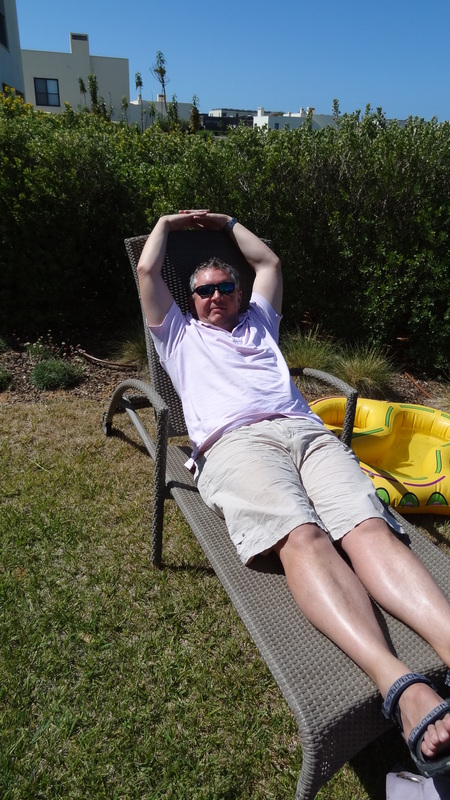 Northgate’s meant to be the best of the local ones in terms of facilities and has a lagoon, though we’re also going to look into the pool at Christleton High, and then at some of the hotels and fitness centres. 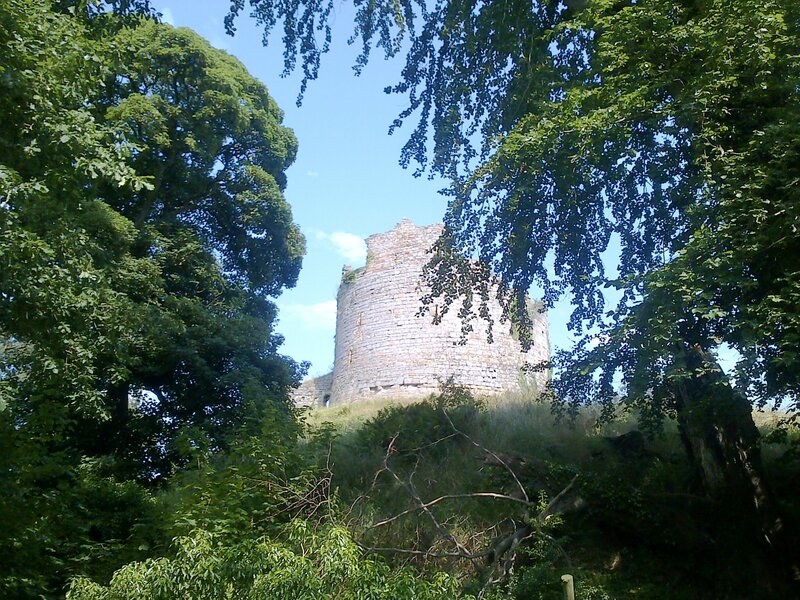 Beeston and Peckforton Castles. Beeston has bats! Cooool! This is a bit further for us so maybe one to save for when Charlotte’s a better traveller, but it’s a huge area and all the local schools seem to have orienteering/camping trips there. Wholesome, outward bound, Blytonesque heaven. 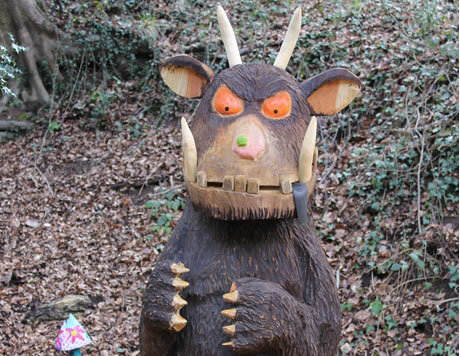 Most excitingly, it has A GRUFFALO TRAIL with a seven foot carved monster at the end of it. Nearby is Blakemere, which is a craft village with regular falconry displays and when they’re a bit bigger they can handle the birds. For bigger kids there’s a Segway trail. CHESTER ZOO! It’s annoying we haven’t done this yet as obviously it’s our local top attraction, but I am just struggling with the value:time equation. It opens at 10 and closes at 5, but the issue is ours still sleep from 12.30 to 2.30, so we’d only get a couple of hours…But as soon as they start dropping that we’ll be off, and I imagine will be buying an annual pass. 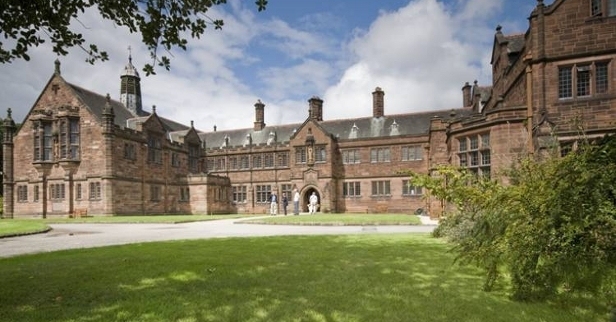 On that note, he and I are also keen to visit Gladstone’s Library by Hawarden Castle, his old ‘hood. I’d never heard of this, but he left his entire collection to the nation, which has now been supplemented. It looks stunning. You can be a Reader for free and they actually encourage people who work from home to do it from there once a month. They hold regular talks and seminars and offer a ‘Welsh in a Week’ course, which we may be brave enough to do at some point! We’ll obviously make use of the multitude of canals near us when they’re a bit bigger, and then there’s the whole of North Wales (including gazillions of castles, caves and the Thomas steam train in Llangollen) to explore when we feel confident about taking them on the boat we have at Conwy. But the thought of that just makes me feel a little bit tremulous at the moment! For newcomers I’d also advise signing up to the New Mums in Chester Facebook page which I am finding invaluable when it comes to local nuggets, and there are regular meet ups too. If anyone has any other advice, or questions, feel free to post in Comments below. 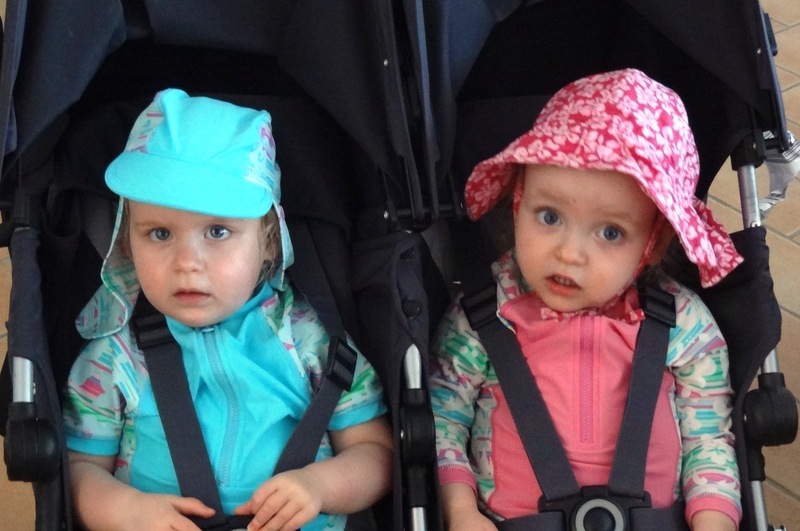 As both a Mum and an embryonic Brainologist, the girls’ twinness is fascinating. I have constructed a small table below to highlight what I mean. Possessiveness (toys, me) MINE! There you go! 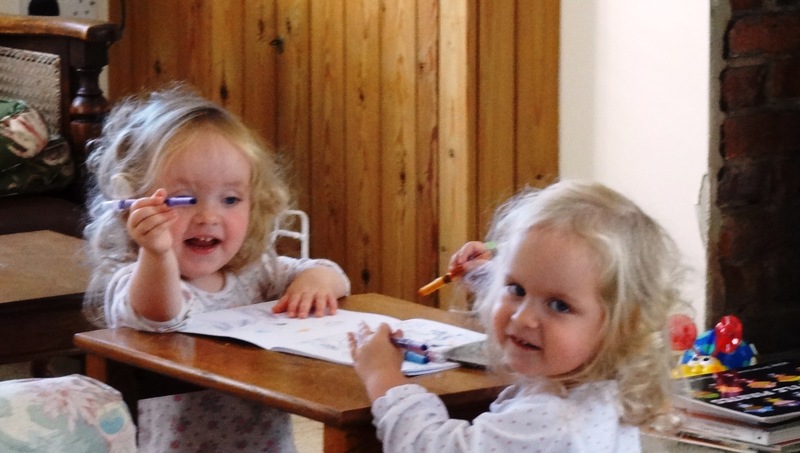 To the outside world, they are a unit, and I still get asked whether they are identical. To me, this is bewildering, as they’re as different as cats and dogs, and it’s almost as if they have made a conscious decision to force distinction. In a way, that’s a good parallel. Romilly, on the whole, has feline self reliance, whereas Charlotte has an eager puppy’s desire to be permanently next to/on/in you. Medically they have their different peccadillos. I’d been worried for a while about Charlotte’s ears. 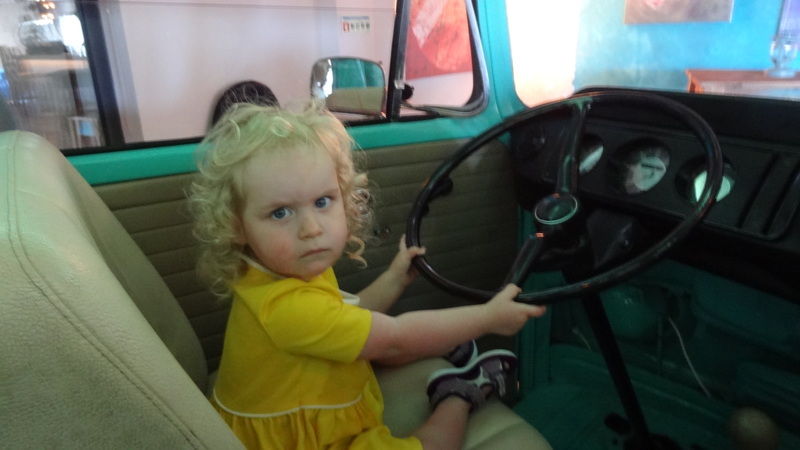 I think she’s been doled out antibiotics SIX times by the GPs, and I wasn’t happy about that. 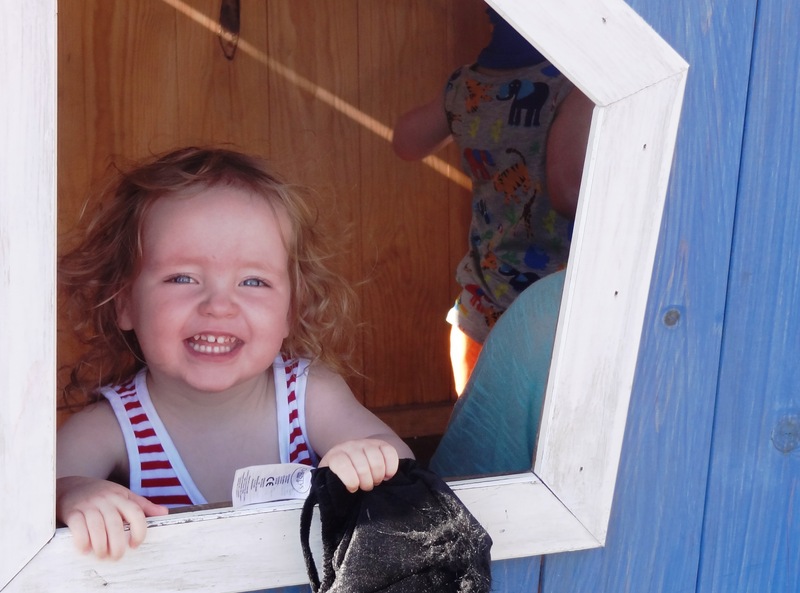 On the last two occasions her eardrum burst, which must have been agony for the little love. I’d got myself into a tizz reading A Million Little Pieces, where the Fury that drives the author all his life and which he turns off with Crack is the result of the noisy agony he had as a baby from untreated ear problems that left him with only a third of his hearing. I naturally decided that if Charlotte’s problems weren’t addressed she would be on Crystal Meth by her tenth birthday. 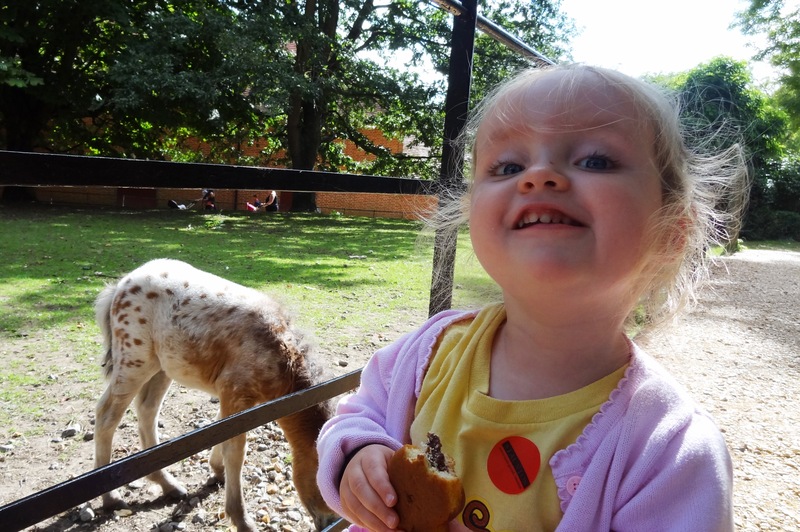 We’re still waiting for her NHS appointment to come through, some six months after asking (gnarr), but fortunately were able to use insurance to go private. Her hearing tests have been fine, which is unsurprising given her language is excellent (I got ‘look Mummy nice day’ this week when she came down to breakfast and the sun was shining; she’s also very adept at copying even my least thought through phrases, womanfully trying to get her mouth round ‘Jesus Christ on a bendy bus’). But they passed waves through her skull (technical, me) and the ‘bump’ revealed the blockage caused by Glue Ear. She’s just had blood tests as the hope is it’s because one of her baby immunisations hasn’t taken, so the solution is a simple booster. Else grommets beckon. She’s been so good about it, compared to the screaming abdabs that every poor doctor used to be greeted with. We bought her a book about going to the doctor, and they each have a toy medical kit, which we routinely take along to appointments in case the doctor’s forgotten his stethoscope that day. In fact, she’s so into it that every time someone says they’re heading off to the car, she asks ‘ear?’, wondering whether it’s because they’re getting checked out too. For Romilly, it’s all tied into her celestial fairness. 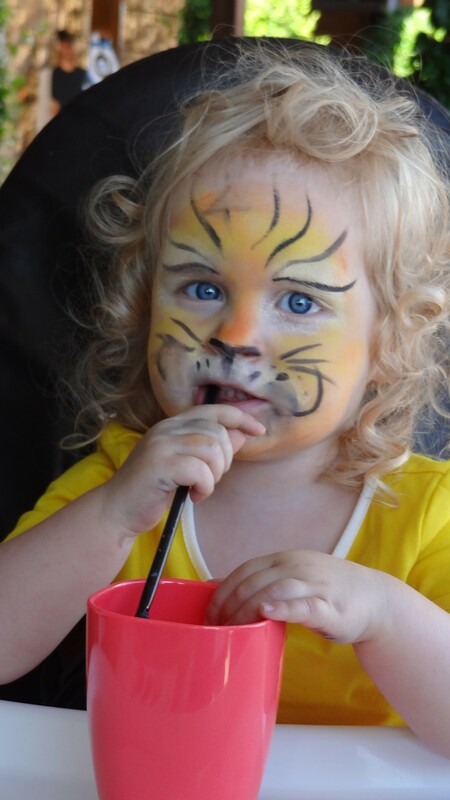 She’s lacking a bit of pigmentation behind her eyes, which means bright sunshine is an issue as she’s photosensitive. There’s not a lot that can be done about it, as sunglasses never stay on, but it’s something to keep an eye on, boom tish. 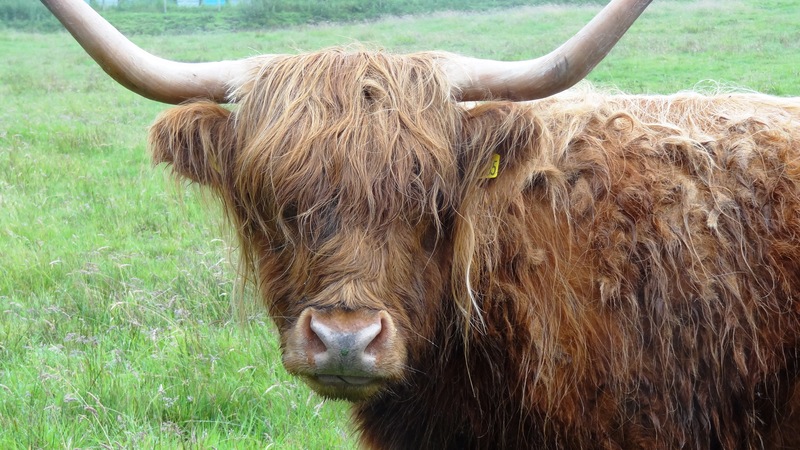 She had a bit of a lazy eye too but that seems to be disappearing. She has eczema, but has only really had one bad flare up. We’ve got steroid cream for if and when that happens, and have then just been using a generic skin emollient as she gets dry and bumpy skin on her arms and face, and a hypoallergenic sun cream and bath foam. We’ve just been sent some Oilatum Junior Lotionby the kind folk at GSK so will see how that works out. 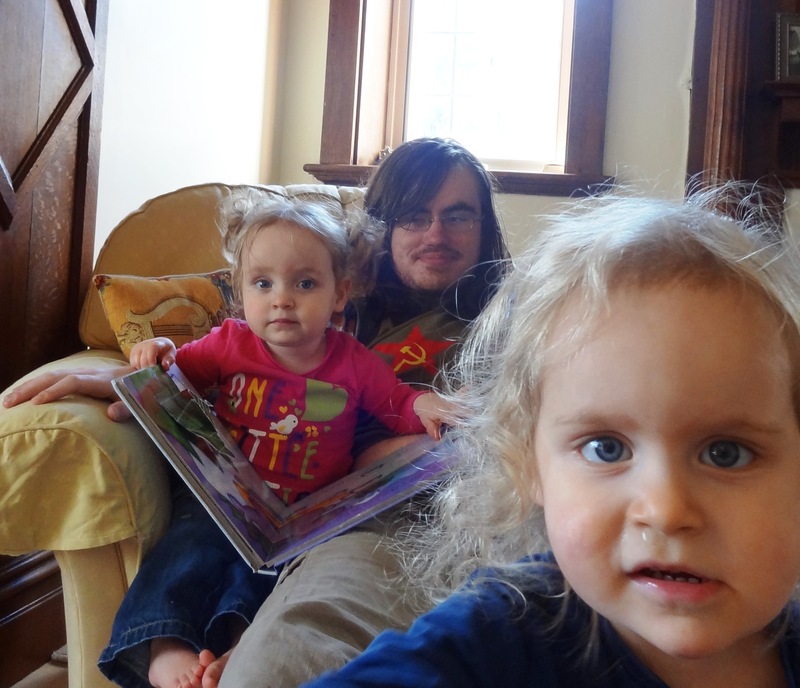 She also has a bit of cradle cap (Charlotte has a bit less, and hers is disguised by her unruly mop, whereas Romilly’s hair is still very fine). GOD it’s hard to resist peeling it off! But I have heard horror stories of infected scalps so I am keeping my fingers to myself. We’ve been using Dentinox shampoo, but it’s maintaining rather than removing, so I think it might be onto more traditional methods ie smothering her in olive oil of a night. 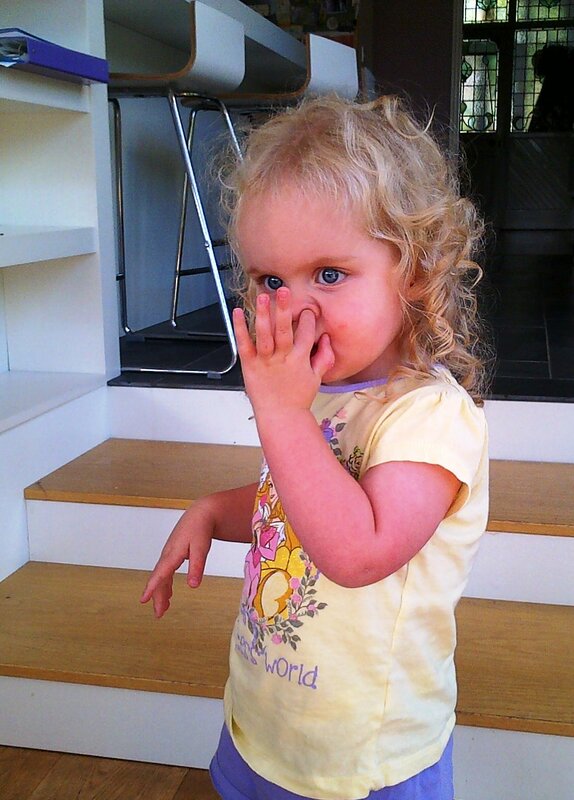 She’s very snivelly at the moment, without having a cold, so I think she may have hay fever too. 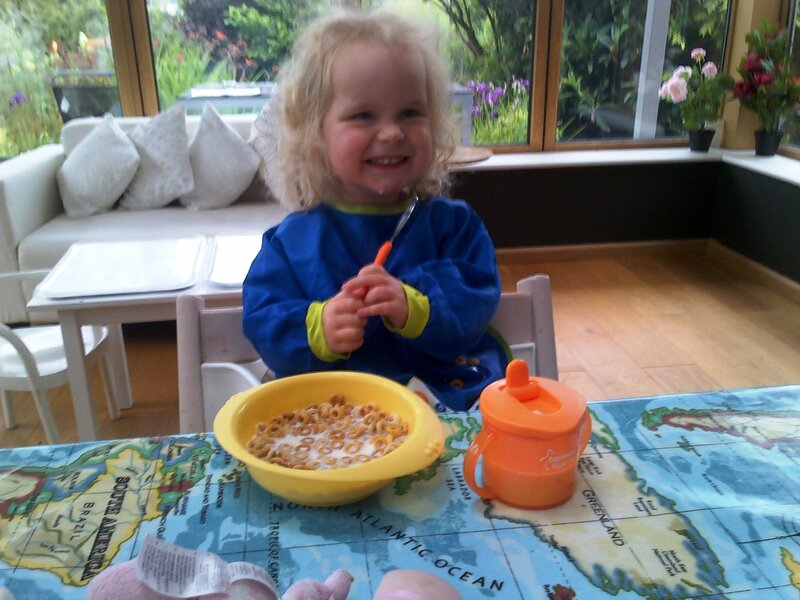 Romilly is definitely Little Miss Atopic. And then there are the general aches and growing pains. Charlotte moans ‘oh, my KNEES!’, like an 80 year old with rheumatoid arthritis after a hard morning’s bowling. I suspect this is because she’s developing knee caps now she’s not crawling (babies aren’t born with them, for precisely that reason – hats off to Mother Nature and the way she thinks of everything). 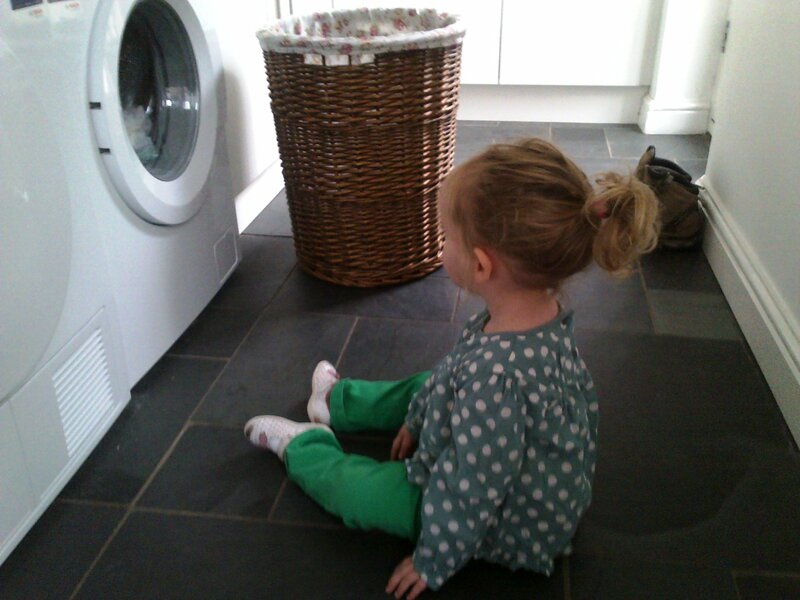 And Romilly goes ‘oh’ and ‘ah’ when she gets up or sits down, like an, er, 40 year old Mummy getting up off the sofa. 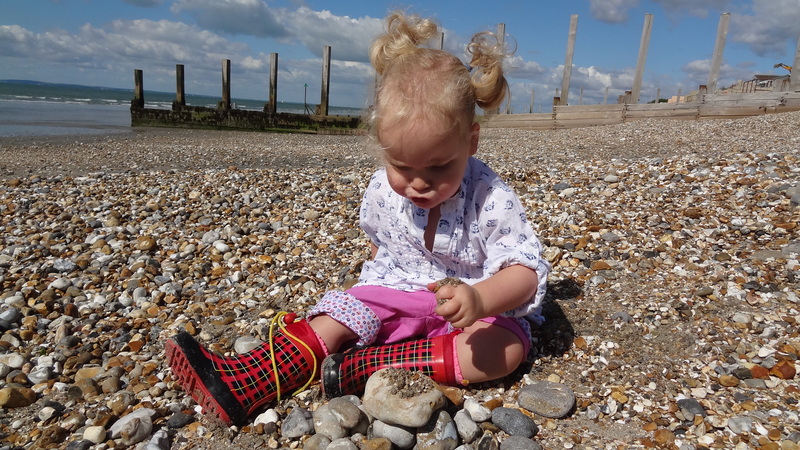 She also gets blisters on her feet, but I think this is because she is obsessed with taking her shoes on and off, a task she managed magnificently in front of the Health Visitor at their recent 2 year development check. She actually slightly freaked me out. 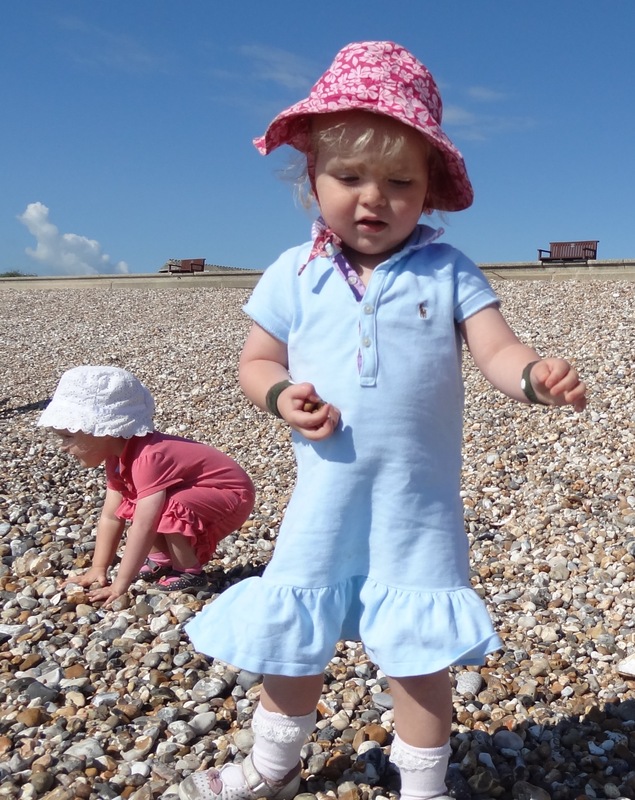 The HV had just asked ‘and how are her fine motor skills’ to which, unprompted apart from that, Romilly proceeded to thread her shoe strap through the buckle and put on her foot. Go girl! But what else is she understanding? There is a mole in our midst! Mummy is not immune to aches and pains either, though sadly mine are not linked to growing. Well, not upwards anyway. Oh, my BACK! I am really bad about scooping them both up and not taking time to ‘lift with the knees’. Life’s too short and theirs are too precious; if they’re toddling towards the road I’m going to catch them. Upshot is I was gradually becoming immobilised with pain. But as luck would have it there’s a Chiropractor two doors down from us. Gosh that stuff is white magic! And how satisfying to hear the clicks! It’s only taken two sessions to feel normal again. And doing my exercise sheet, which the girls join in with, to amusing effect. We like the yoga on Waybulloo too. 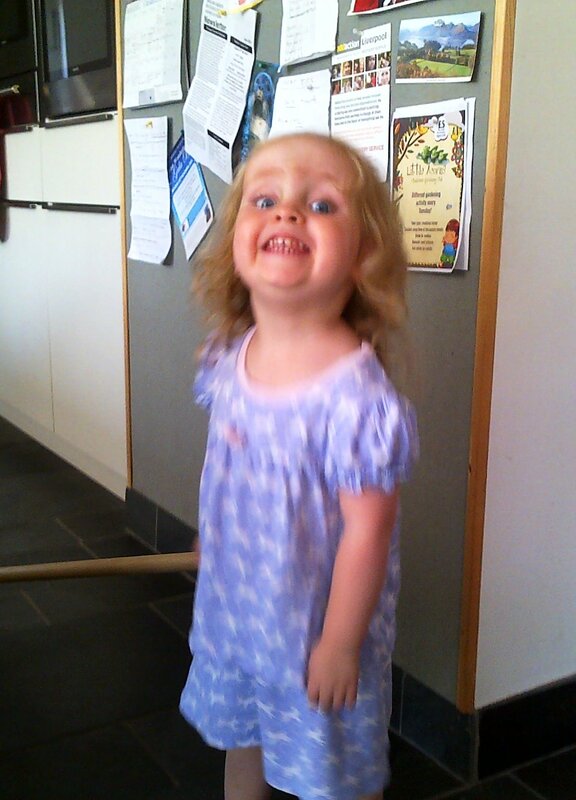 Charlotte now regularly scuttles sideways round the room like a crab, though has decided that crabs ROAR. 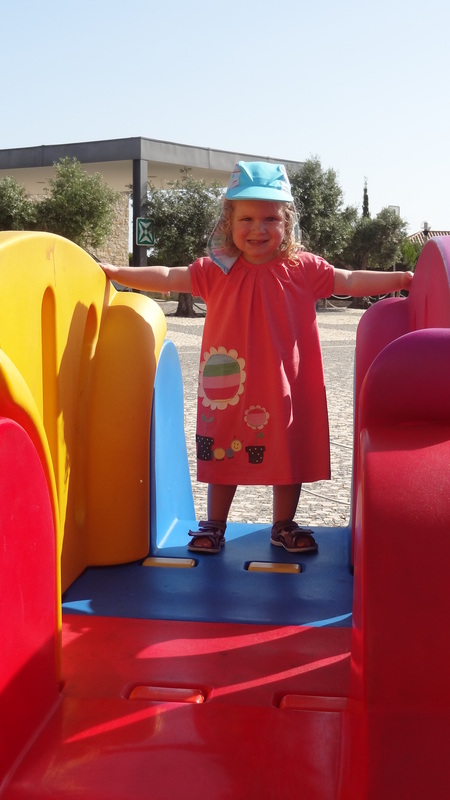 Romilly is a stuntwoman in the making. 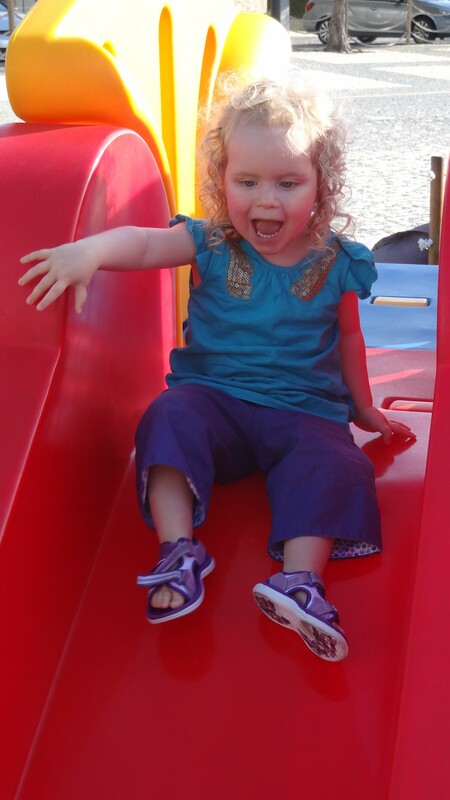 Turn your back for a second and she’s heading to the highest slide in the playground. 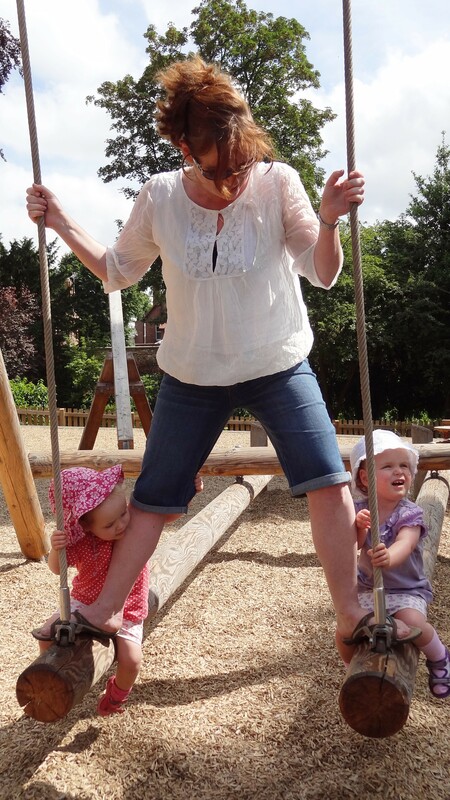 She squeals with delight the higher you push the swing, whereas her sister cries if you suggest her even going in one. Tied into that is the biggest difference of all – personality. Charlotte to the outside observer seems extrovert and dominant. She’s bigger, noisier, more ‘present’. But underneath she’s a little flower. Jon says he finds it heartbreaking when she insists on carrying all her worldly goods round with her (which often means she can’t actually move anywhere or do anything, weighed down as she is; it’s getting like Crackerjack – the other day she had her spider, her best label, two teddies, her juice, and then was trying to carry an entire tea set too). He says she looks like a war refugee. 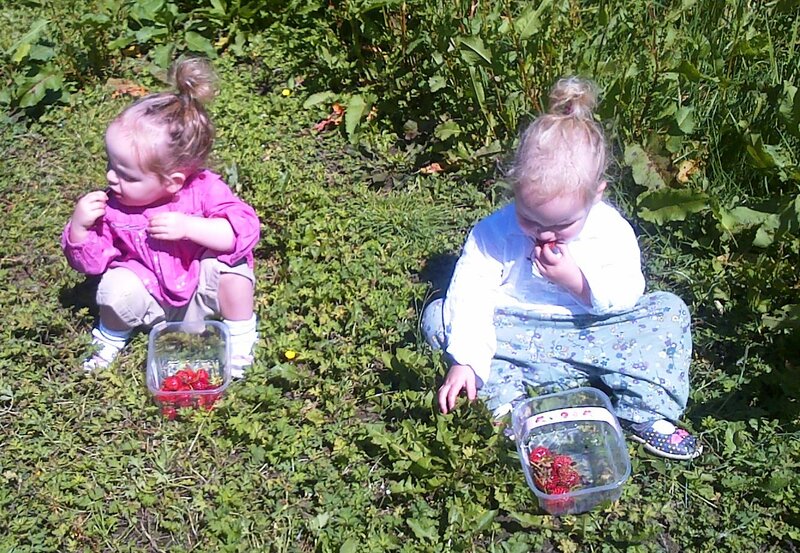 I wonder though how much of it is simply because she doesn’t want her sister getting her mitts on anything. Which is silly, because Romilly, in a striking display of maturity and altruism (which actually upsets me more) is always fetching things for Charlotte and knows exactly which labelly thing to give her whenever she’s crying. But, yes, I worry. To what extent am I exacerbating the distinction? Romilly is just so much EASIER. But in letting her get on with life am I teaching her that she doesn’t matter as much? That she doesn’t deserve as many cuddles? Is she in Charlotte’s shadow? Does she think I love Charlotte more? Am I effectively pushing them into high and low maintenance positionings? It’s bringing back memories of a heart rending book I read when I was young called Jacob Have I Loved, in which the healthy twin thought she was the black sheep and spent her time paddling alone through the creeks of Chesapeake Bay, when in reality it was simply because her parents had to devote more attention to her poorly sister. That cannot happen. Sometimes I am reassured though. 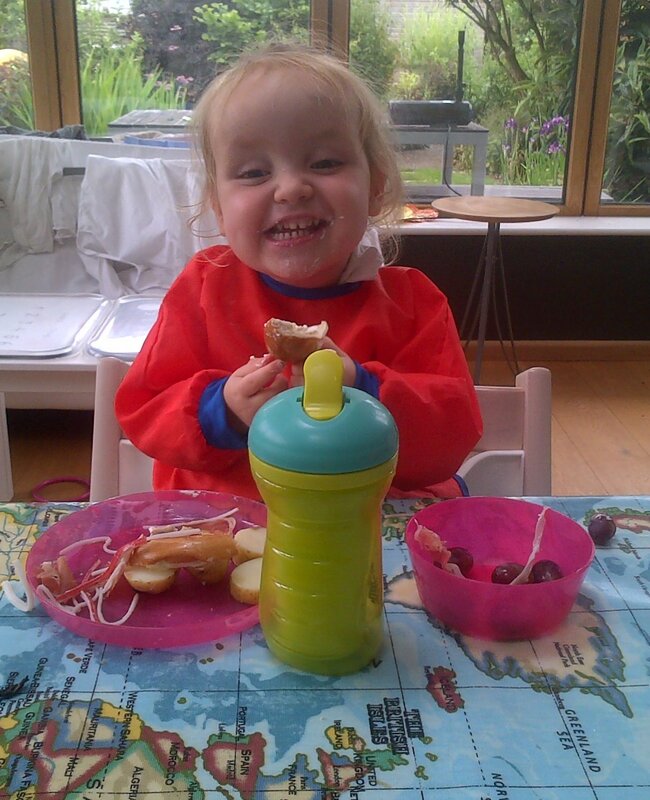 Romilly occasionally bares her teeth. There is a steely core to my willowy girl. Toys aren’t always handed over. 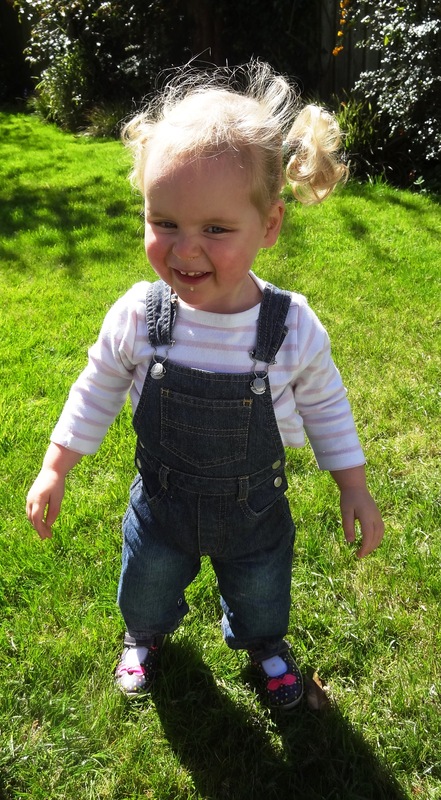 Her favourite word is an emphatic ‘NO’, accompanied by a glare, and a turned back, and most often employed when Charlotte is suddenly interested in a toy she has forgotten about for weeks but sees Romilly playing with. I think the solution, as I have said before, is to ensure we’re spending individual time with them. But that’s difficult to achieve as, by definition, there needs to be two of us there, and that is a rare occurrence. But it is definitely a stretch goal. A few times Romilly had woken up from a nap earlier than Charlotte and so had a Mummy and Daddy bedtime snuggle. This is now a regular occurrence. Doh. Of course she’s doing it on purpose because it’s Romilly Time! But if any of this gives the impression that they’re deadly rivals, that’s not the case. Well, not all the time. Again, from a developmental perspective, it’s like they’ve fully clocked each other now. They play together, probably a quarter of the time. ‘Row, row, row the boat’ is a favourite, where they sit opposite each other holding hands. 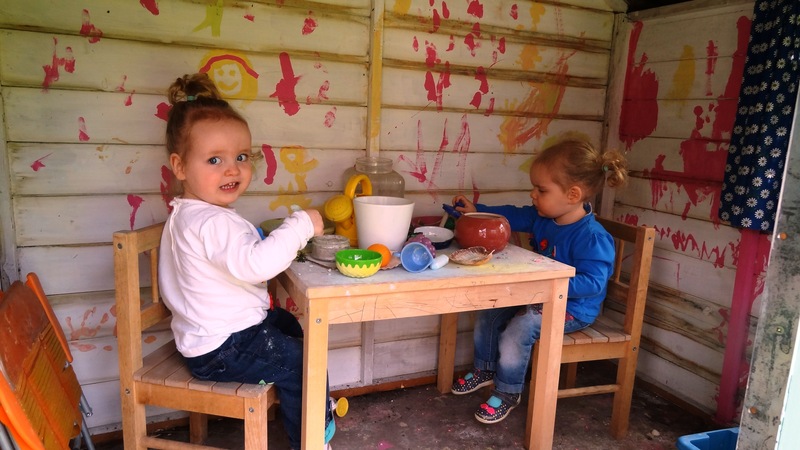 They’ll serve each other pretend tea and biscuits, and will conduct complex transactions involving actual food at the dinner table (this is mostly Charlotte giving Romilly all her healthy food in exchange for anything that resembles pudding). There is some very detailed game involving rushing round the car tent which is allegedly HILARIOUS – they are doubled over and shrieking with laughter – but I am still to grasp the rules or even objective. There are snatched cuddles. Concern and ‘aw’ when their twin is sad or poorly. Or when they’re absent; helpfully I always get reminded by Charlotte to put ‘Momree’ in the car too. 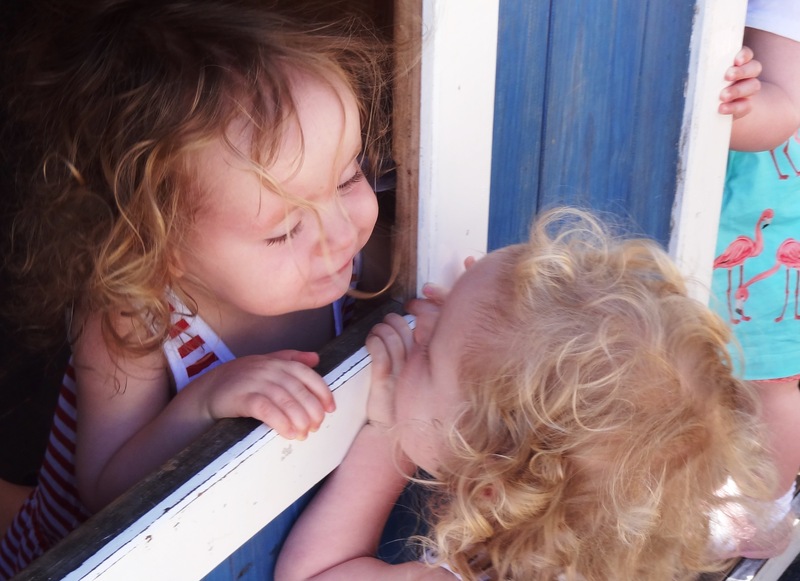 And most toe squidgingly cute of all, they always hold hands when they go through the nursery door. They haven’t developed the secret twin language that some multiples have. Maybe that will come later. But I listen to them each evening and morning on the monitor chuntering away to each other. 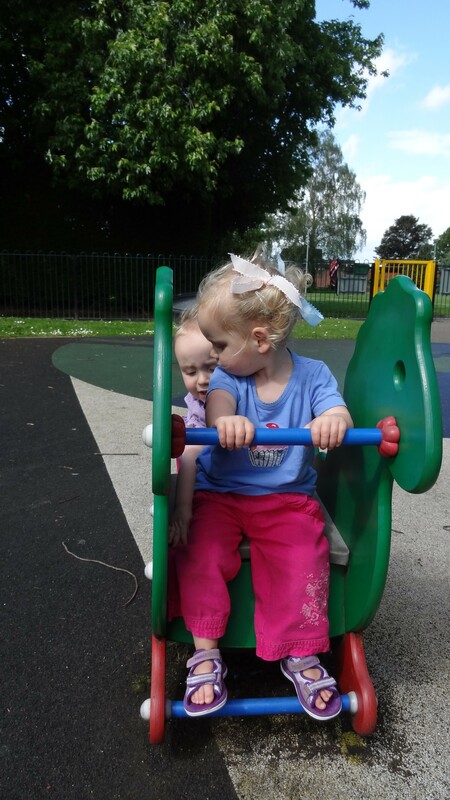 This usually involves Romilly telling Charlotte to shush. I am SO going to leave the monitor hidden in their room until they are, oo, about 18. I think eavesdropping is a perfectly legitimate parenting tool. Right. I must dash. Jon is on his way back and I need to hide the small mountain of emptied Phish Food ice cream cartons that stands in for him in his absence. He’s been circumnavigating Anglesey for a whole week and allegedly is returning with PIRATE TREASURE. Hopefully he’s got something for the girls too. …when it comes to bottles of Calpol to take on a fortnight’s holiday with twins (not when it comes to toddlers. I genuinely have no idea how triplet parents leave the house. Which is why we are never breeding again).You would think half a litre of Calpol was enough, wouldn’t you. 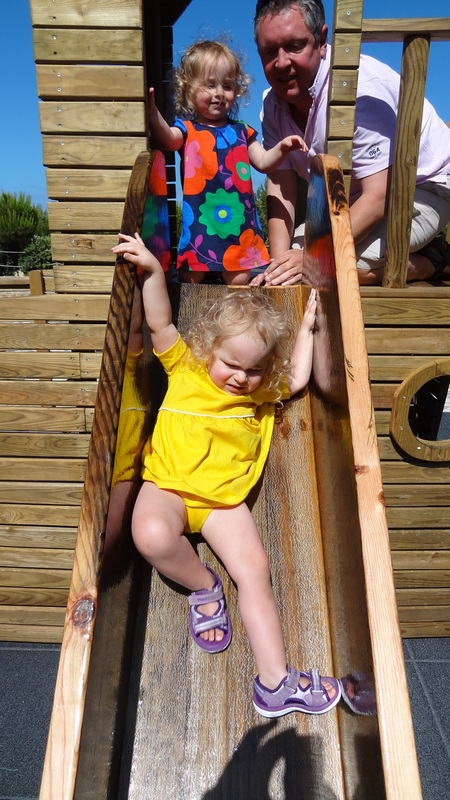 But Charlotte took it upon herself to take part in the grand Walsh tradition of getting crook at Martinhal, though luckily it was just flu this time, rather than the hospital dash we had to make last year with her sister. 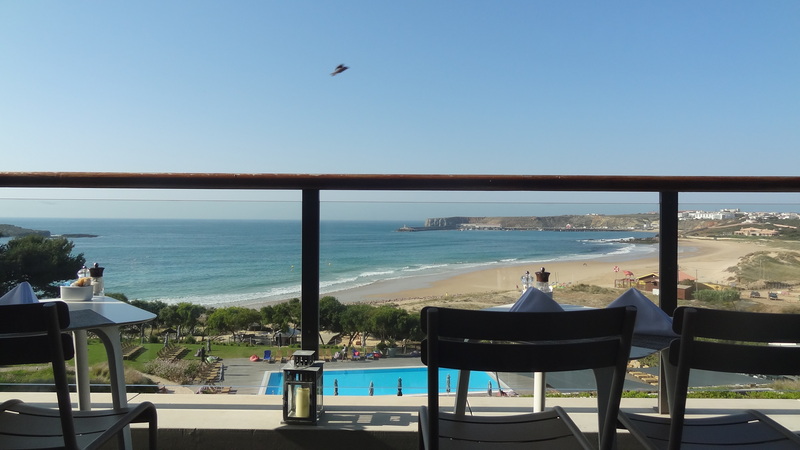 So, second time at the self styled ‘finest luxury family resort in Europe’ at the very southern tip of Portugal, and it was even better than the first. It would be marvellous to have the money just to spend every holiday there henceforward. 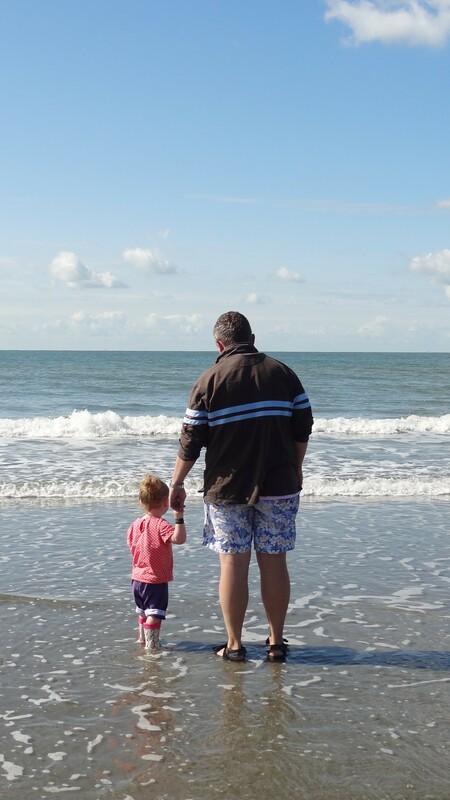 It’s not exactly a voyage of cultural discovery but, to be honest, with toddler twins I’d rather a steady supply of blueberries and rice cakes than yurts and yaks and yeti hunting. 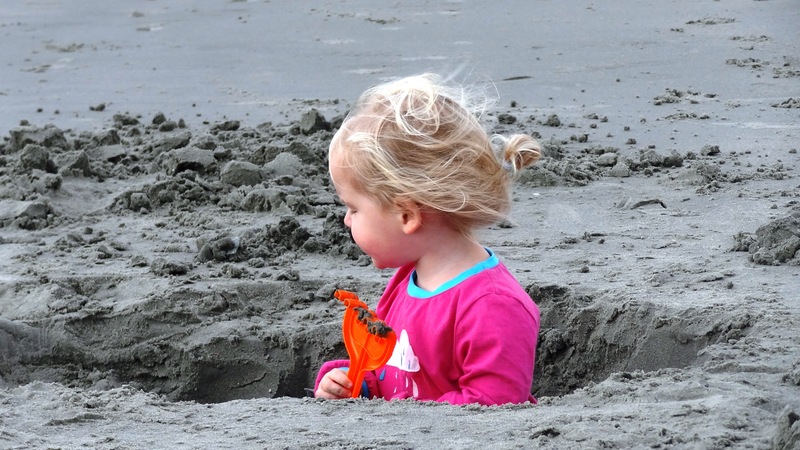 I’ll spare the nuts and bolts of the review – see here (and scroll down for my review entitled ‘soooo close to perfect’) if you’re interested – but suffice to say, it just WORKS when it comes to kids having a great time, and their parents being able to relax. Occasionally. By about halfway through Week Two when your kids have finally settled into their two hour Kids’ Club slot, are both not-dying, and you’ve finished doing work emails! The second involved a large fox. Rafi is the kids’ club mascot and dances with his girlfriend Rosita to ‘I’m a Gummi Bear’ (no, no idea either) at 6pm every night in the main square. The twins got super excited by this. That kind of delicious shaking, scrunched up face, grinning, jiggling excited when it’s just going to bubble over or turn into some sort of emotional seizure. 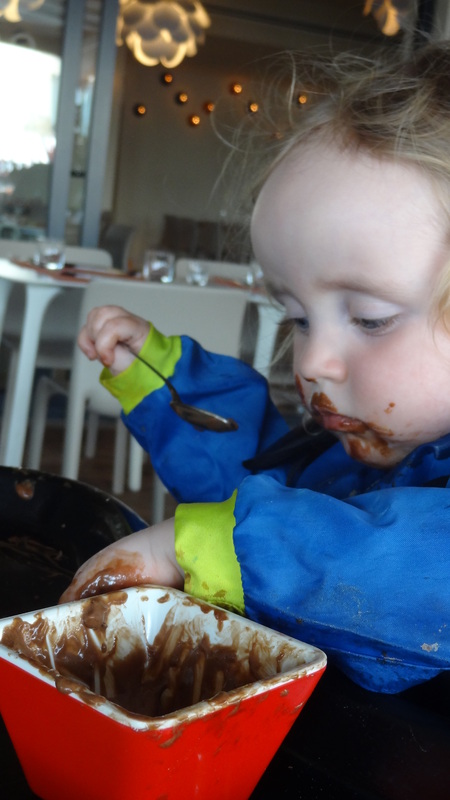 We’d have to leave dinner at whatever stage it was at (their love for Rafi evidenced by the fact they’d even abandon pudding for him) to go and boogie. By the final week they’d sussed which door he’d emerge from and we’d have to get into prime position ten minutes early so they could high five him. And then on the very last night, Charlotte dashed to the front and took his hands/paws and danced the Gummi Bear in front of the whole resort. Jon was all choked up, which set me off…she danced with the fox! She danced with the fox! 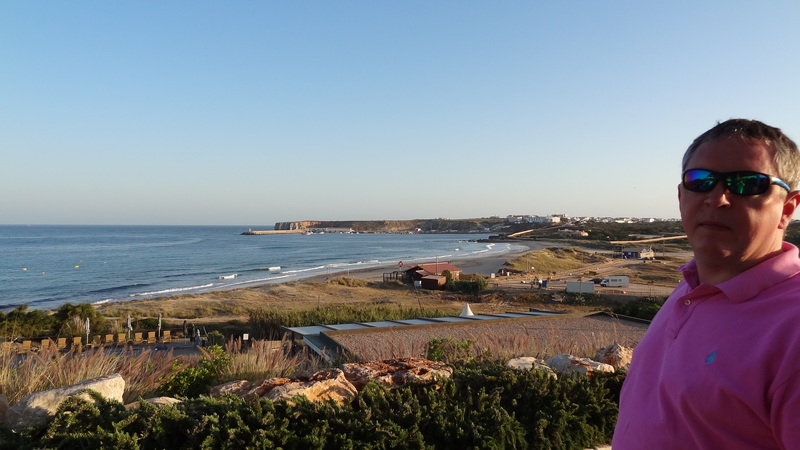 Just a lovely, lovely holiday. I think one of the real benefits was Jon being able to spend a really goodly amount of day-to-day time with the girls as he’s missed out so much recently with crazy work travel. Talking of which – that was the only low point. Our flight back from Faro (possibly The Worst Airport In Europe) was delayed till 10pm. Yep. 10pm. With 2x2s. Who were awake for the duration despite our frequent buggy sightseeing tours of the terminus. I think I self-hypnotised myself into some sort of trance state – fixed grin, faraway look – as otherwise I can’t explain how I didn’t pop. They were angels though, bless them. They didn’t even act up when we got on the plane (I caught the ‘oh sh*t’ look from the two single male travellers who realised as they walked down the aisle they were going to be sitting either side of our two). In fact Charlotte in particular was super friendly, offering the nice man who was trying to sleep her comic, her snacks, her teddy (the honour), the safety information (in case he hadn’t read it, I assume) and then finally started trying to massage him. Other highlights included Romilly nicking an entire roast octopus tentacle from my plate, complete with suckers, and munching on it like a breadstick; Charlotte not being travel sick AT ALL (the wonders of drugging one’s children); Romilly’s heart-in-mouth bravery on and obsession with all four slides; me dazzling Jon with my slightly shady ability to get BBC iPlayer abroad by cloaking our IP address (a veritable cyber Harry Potter, me); the girls achieving Juggling Level Two with certificates and everything (the mind boggles about Level One given neither of them can really throw, much less catch! ); Romilly doing an impression of me driving in the decommissioned campervan in the surf bar, which involved jiggling to imaginary Radio 2, hauling the steering wheel violently and shouting something which sounded suspiciously like ‘you n*b!’; capitulating for the sake of peaceful munching and letting them make their own selection from the breakfast buffet, which turned out to be, for Romilly: watermelon, serrano ham and sausages and, for Charlotte: donuts and a bowl of beans. In a way this is no more eccentric than their father who would create an approximation of a Full English on his plate, and then add some lettuce, because it’s healthy. Innit. The twins’ ability to find an excuse for a tantrum amazes even me sometimes. Picture this scene. We are playing with the Big Boy (he’s 3) next door in his Wendy House. The merry trio are sat in a row sipping imaginary tea. All very civilised. I then offer them a plate with cake to share. Again – and this is important – the CAKE IS NOT ACTUALLY THERE. IT IS IMAGINARY. IT IS CONCEPT CAKE. 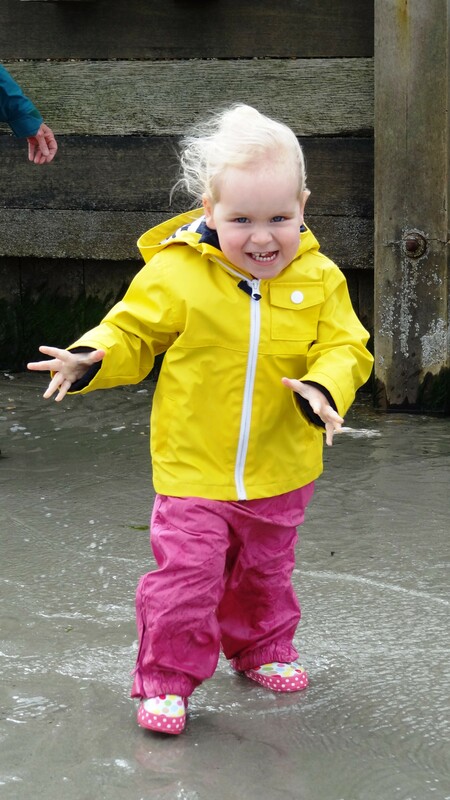 They each put their hand out and then Charlotte’s lip begins to quiver, she screams ‘More! More! My go!’ and then bashes the plate away in what their giant brother tells me gamers call ‘RageQuit’. It’s IMAGINARY Charlotte, my sweet love. You can have as much cake as you want, as many times. But no, she is literally spitting at her own brain’s decision as to how much imaginary cake she was presented with. Ah the terrible twos time two. I don’t know whether it’s my advanced age, or having been through this before with Joe, or whether it’s another case of twin pragmatics (it is simply impossible to wrestle two writhing bodies, so no point even trying), but I am (famous last words) finding it relatively easy to detach from tantrums at the moment. In fact the main thing that is hard is not to laugh. As in CakeGate. But there are other areas of difficulty. As predicted, after fretting for months about their lack of walking I now wish they’d never bloody learned. They’ve gone from 0-60 in the blink of an eye. 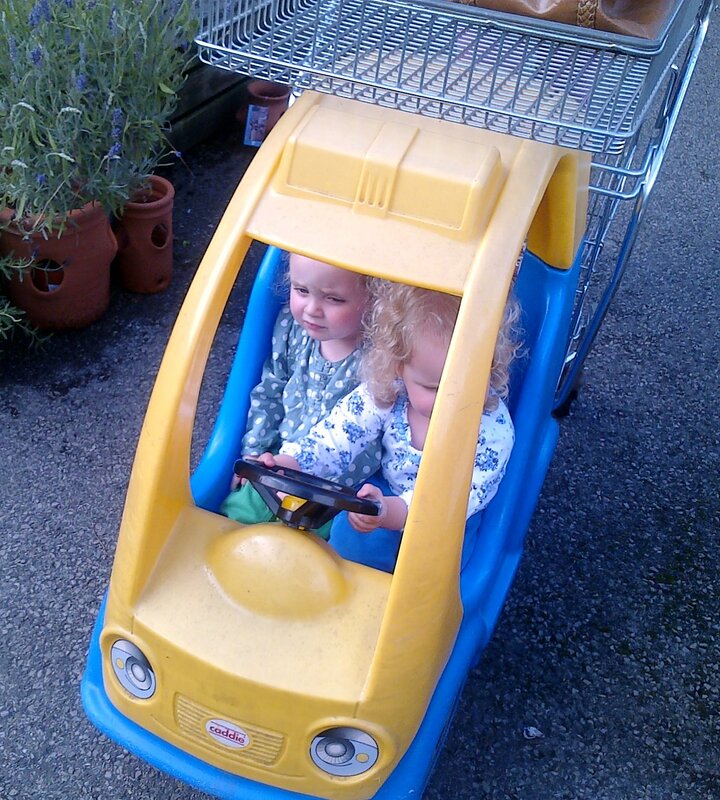 It’s getting very difficult to go anywhere on my own with them unless they’re strapped into the buggy or on reins. I’m not convinced even straitjackets would help that much. At soft play I had to make a split second decision about whether to save the one who was screaming for her life frozen halfway up a ladder, or the one who was screaming for her life who’d caught her ankle in the netting and was suspended above the ballpit. RageQuit was not an option. 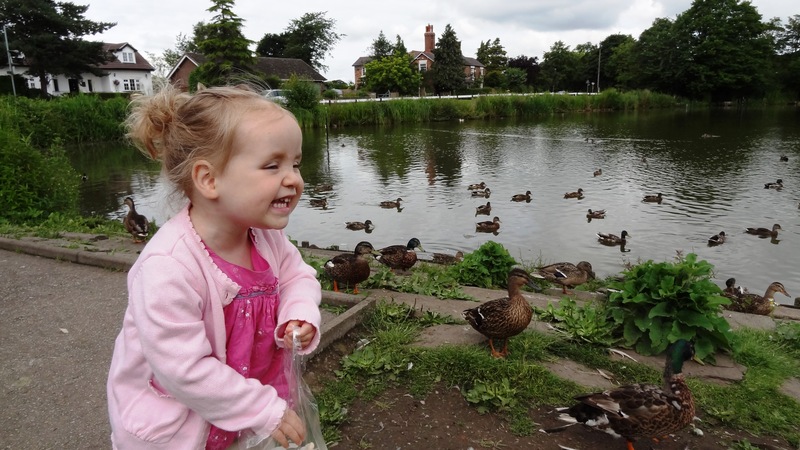 Or at the local duck pond, do you dash to the child toddling at speed towards the water, or the child who’s laughing at a very large, very angry and very close swan? Language is coming on apace. Charlotte has mastered the possessive. There’s a surprise. We have ‘mice’ for my/mine. ‘My go’ gets trotted out frequently; strangely, ‘your go’ is yet to be uttered. 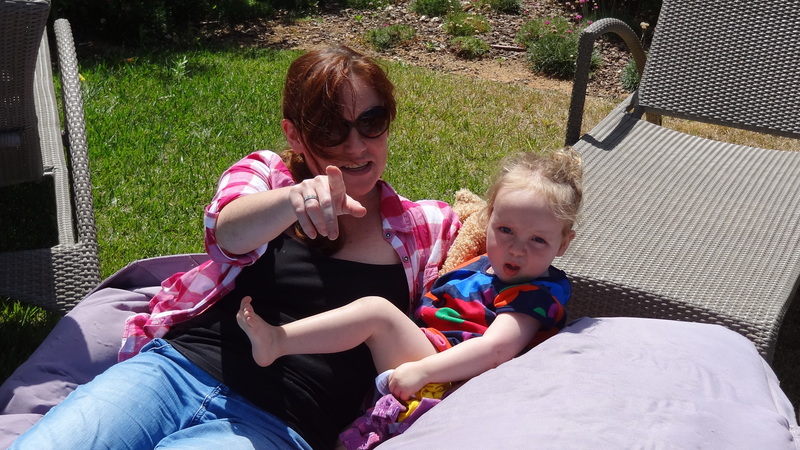 Romilly shouts ‘you’ and points, slightly accusatorily. It’s fascinating though because they’re moving from simple mimicking and nouns to the basics of grammar, and prepositions and adjectives, and the putting together of words, with obvious understanding of what they mean. On the whole (and that’s a very generous ‘on the whole’) they can accept logic. If I explain something to them, for example that seeing who can do the loudest impression of a squealing pig outside their brother’s bedroom isn’t very kind when he’s trying to sleep (tough life being a student on your summer hols), they usually nod and I get ‘okay’ in unison. Okay is by far their favourite word. Along with bagel, der (for spider) teddy bear, ‘mulk’, MUMMMMEEEEEE now, there you go, here you go, bump, crash, o-oh (strikes dread into me whenever I hear this), Dave (they’re very attached to our builder), knees (they may well have early onset arthritis the amount they moan about them, I’ve pointed out that if they concentrated on not falling over more then they wouldn’t get sore), snooze, Joe, miaow, DADDEEEEEEEE, pear (this is for their hair detangler spray), bobble, baby, no-MY-do-it, bath, toast, juice, poo and wee (more of that anon), more, kiki (for kiwi) and nice, said much the same way as Ray Winstone might say ‘sweet’. This is used especially when they are given pork pie. Oh and ‘label’. 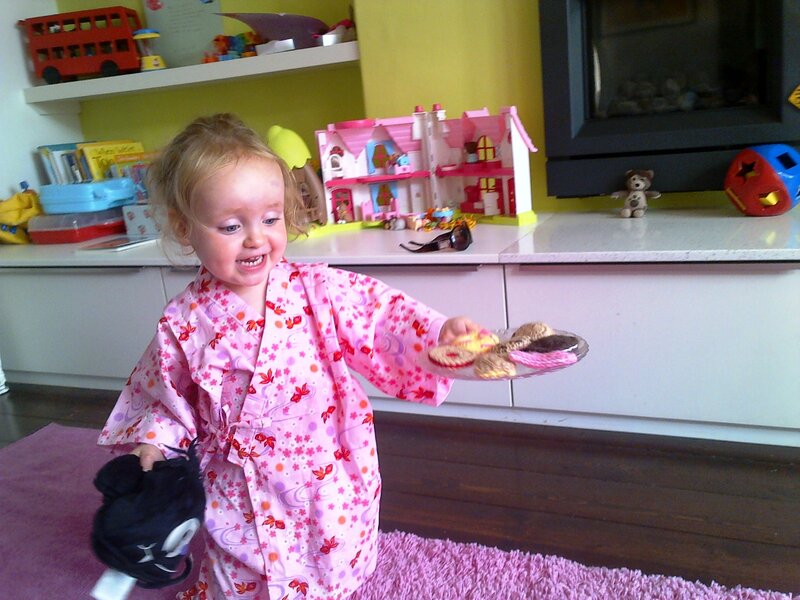 Charlotte has developed an obsession with satin labels on cuddly toys, clothes, blankets, anything. She strokes them between thumb and forefinger against her cheek whilst sucking the other thumb. It has miraculous de-tantrumming properties, so I now carry a stock of emergency unattached labels in my bag. We love music and dancing. Romilly sings to herself as she plays, which is adorable. She’s got rather uncannily good rhythm, and will correctly beat the time, even doing it conductor-style in the air. Her memory for a tune is strong too and we get perfect renditions of ‘ee-i-ee-i-o’ and ‘baa, baa’. Just we can’t go quite beyond that yet. A bit like ‘two’ stands in for all numbers, so 1-2-3 becomes 2-2-2, although with the right inflections, and the rainbow is entirely blue. So, yes, poo and wee. We are very interested. We are going longer periods dry. We know what we’ve done, and when, and will announce it, especially when we’re on the bus. We are very curious about what our twin has produced. And the adults in the house. If I dare to leave them for a microsecond to go to the loo myself I get bombarded with questions when I return. Poo? Wee? Loo roll? Well, thank you for asking. Ah, the joys of property renovation with twin toddlers for whom a drill left out must be a new musical instrument and the builder’s ladder obviously leads to a new slide. Seriously though, they have been angelic. It could have been an absolute nightmare, and it was only a severe one. They amazed me by being able to have a lunchtime nap whilst walls were being demolished above them. But I would add this to my increasingly long list of don’t-do-what-we-did for expectant parents of multiples, along with moving roughly ten million times. Right, I had best sign off now. Hopefully now that the move and (most of the) renovation is out the way I’ll be back on here more, work permitting. For, yes, I have my feet under various desks now. I have a placement in the Acquired Brain Injury Unit at the Countess of Chester, another with drugs charity Addaction in Liverpool, and with HIP (Head Injured People in Cheshire). I am on cloud nine, to be frank. 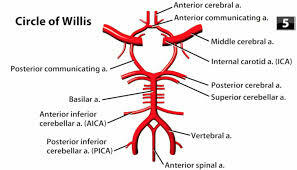 It is a complete joy to be learning again, though I am deeply disturbed by some of the Neuroanatomy I’m studying, especially the ‘Circle of Willis’* below. That THING, that little freaky man thing, IS IN MY BRAIN! *there are some seriously cosmic names for stuff in our heads: the Acqueduct of Sylvius, the Island of Reil, the Foramen of Monro and the Sulcus of Rolando being but a few. Maybe one day I’ll reach the dizzy heights of naming the Fissure of Bichard, which is where twin Mums’ brains have literally been ripped apart trying to decide which child to prevent from shoving a fork up their nose first.